"The Atrocities committed by German Fascists in the USSR" is the title of a Soviet documentary film shown at the Nuremberg Trial of the Major War Criminals before the International Military Tribunal on 19 February 1946, parts of which used to be viewable on Youtube. 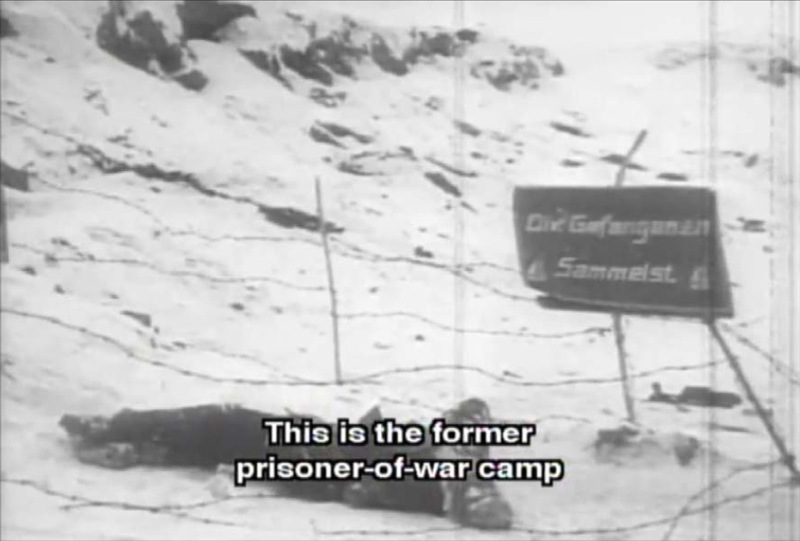 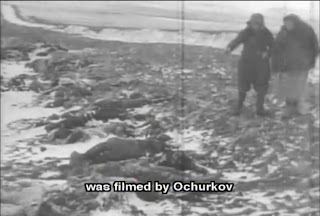 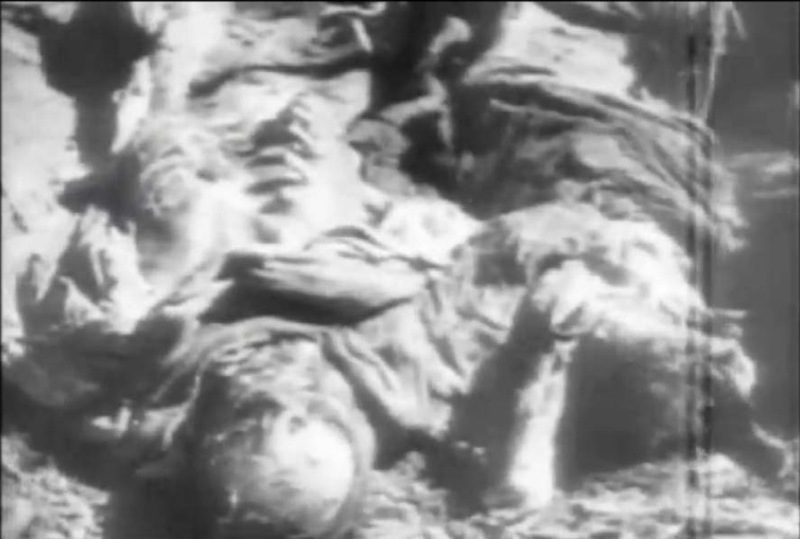 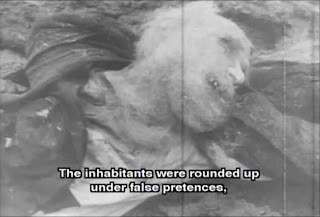 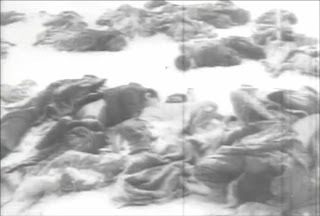 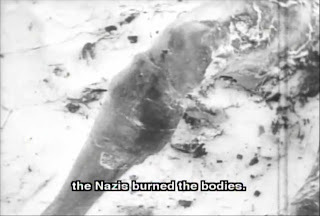 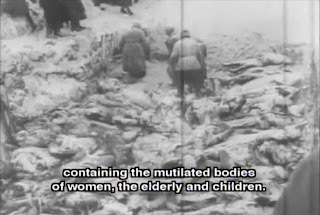 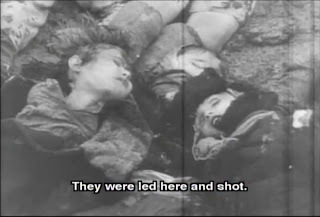 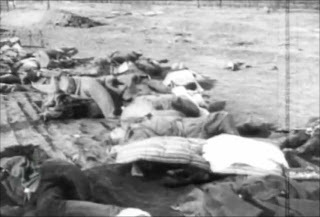 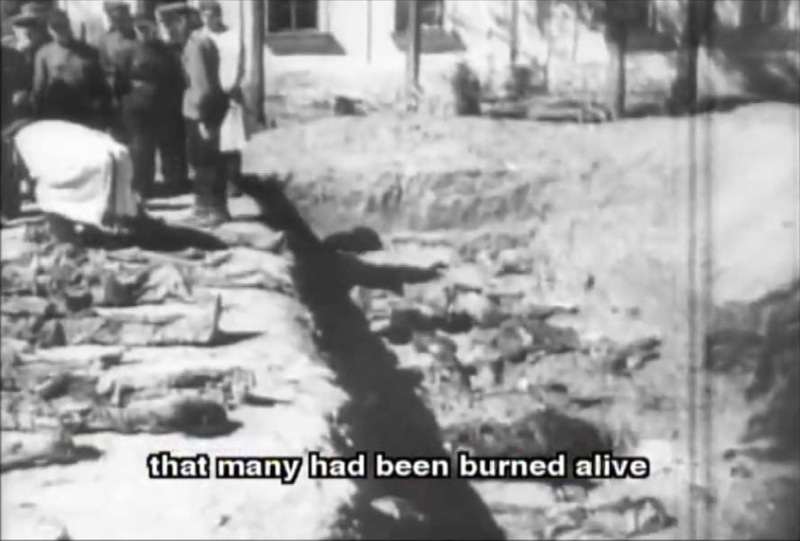 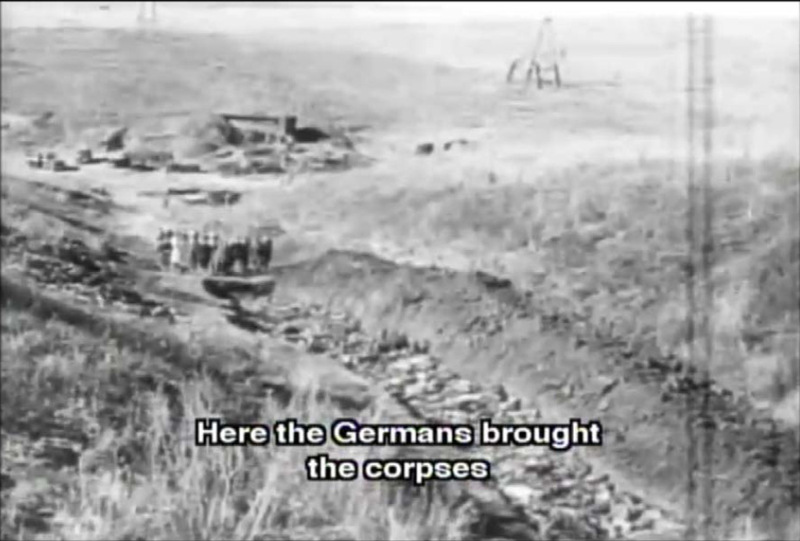 Despite its title, the Soviet documentary also shows Nazi atrocities committed outside the Soviet Union's borders as of 22 June 1941, including the concentration and extermination camps of Auschwitz-Birkenau and Majdanek. 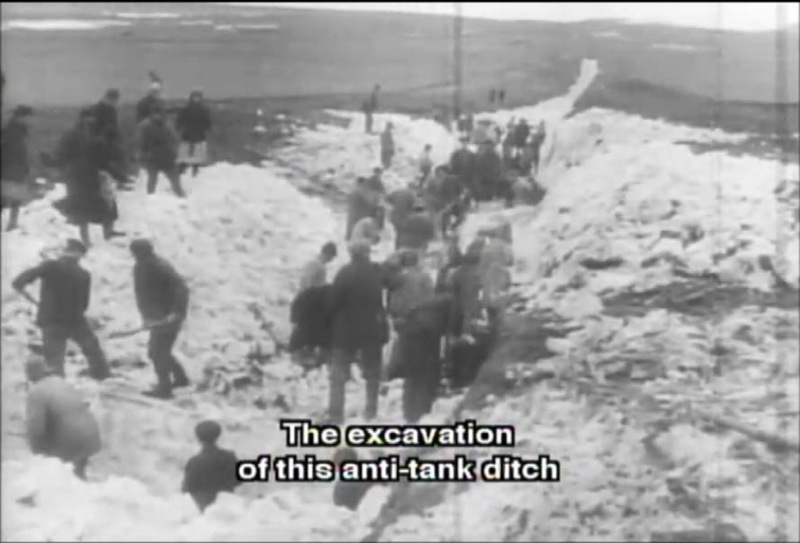 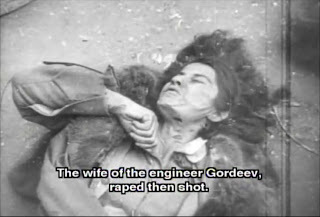 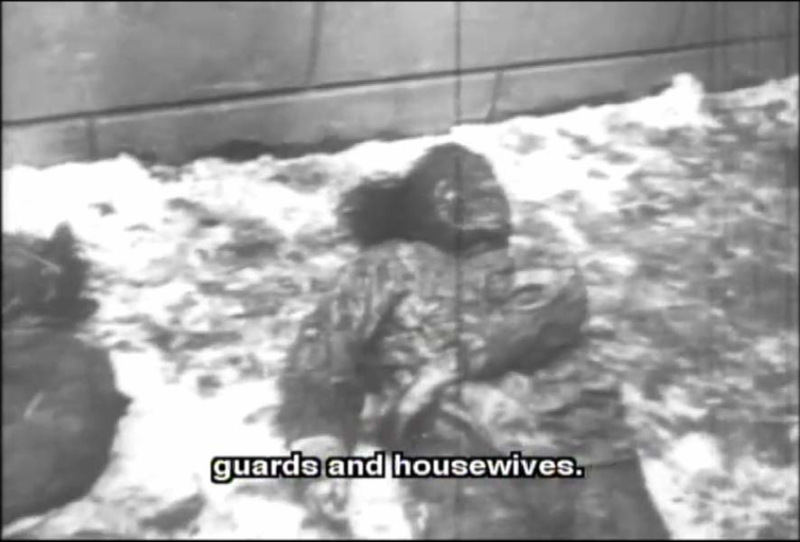 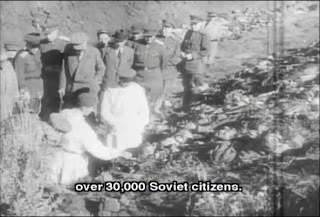 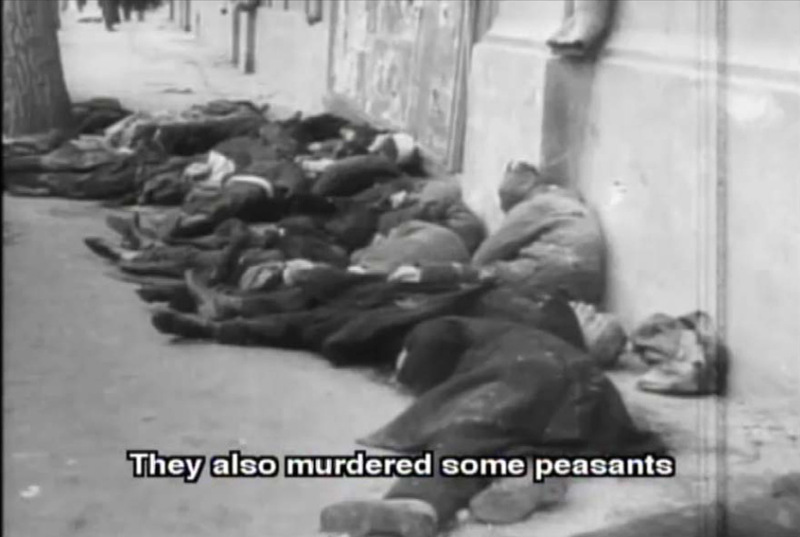 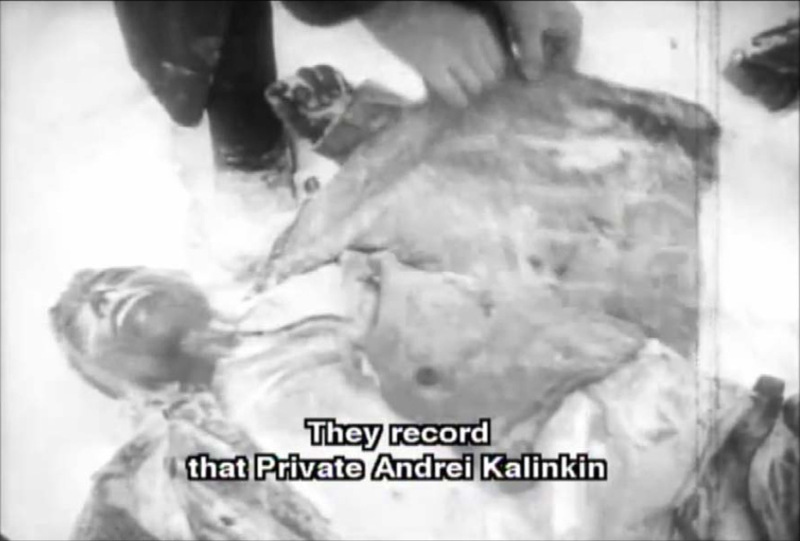 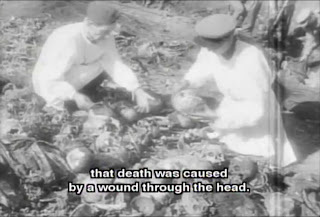 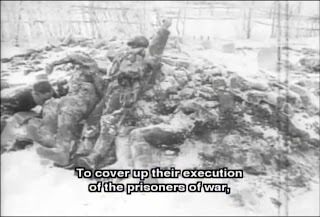 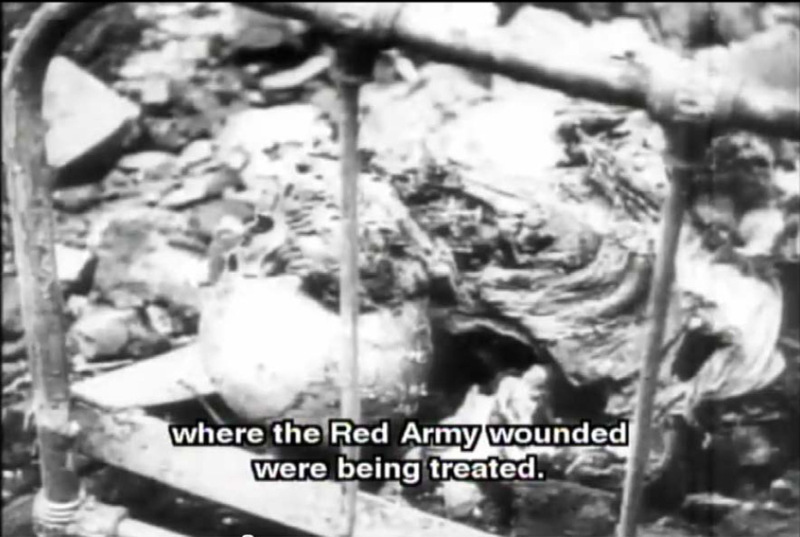 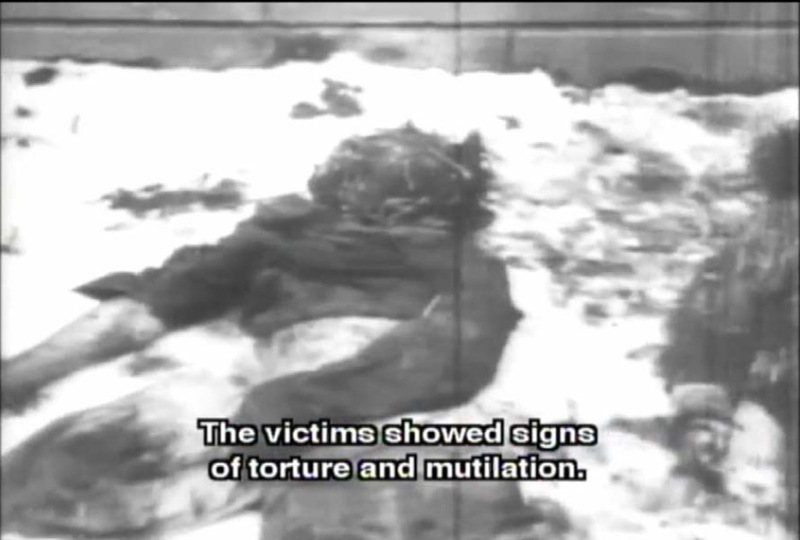 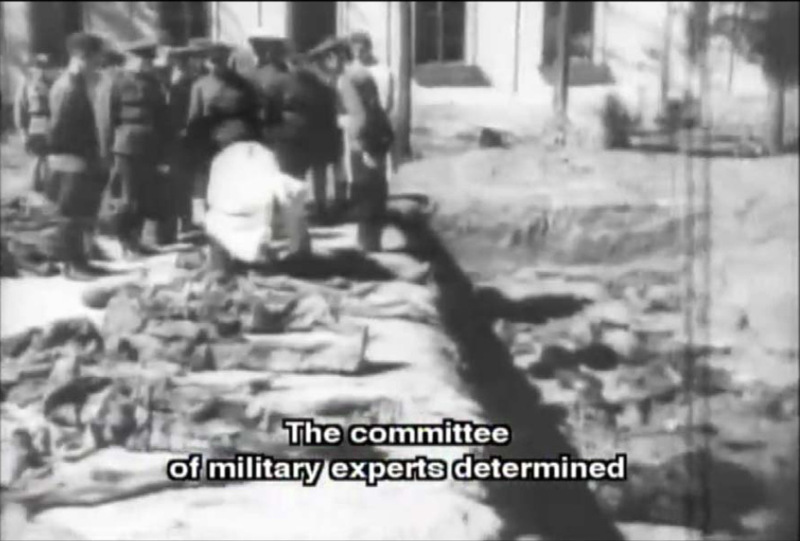 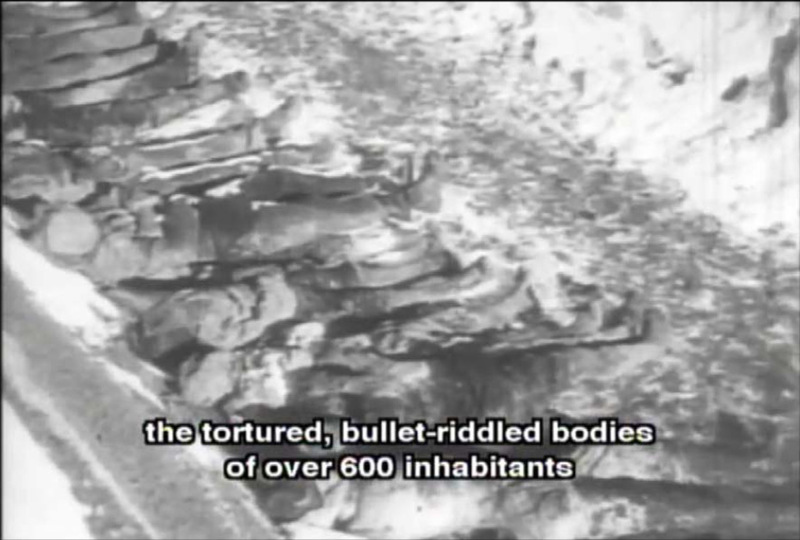 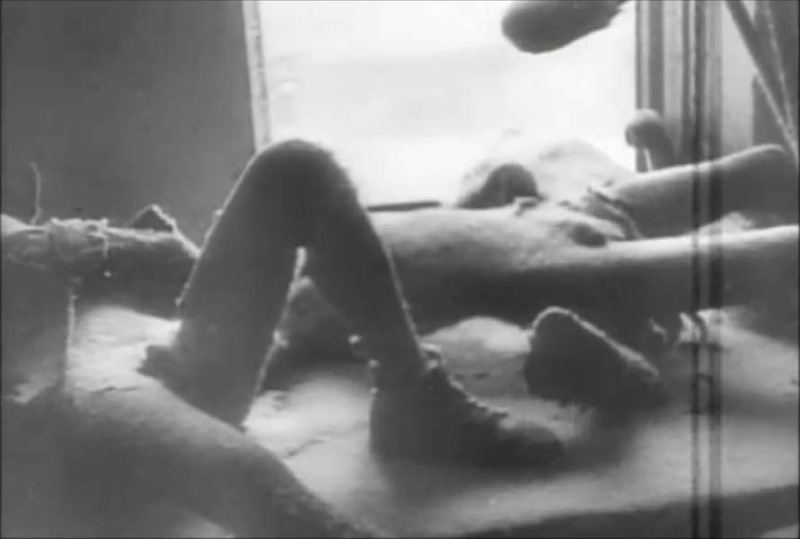 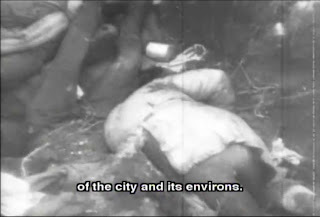 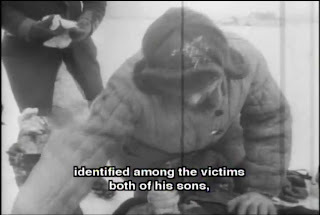 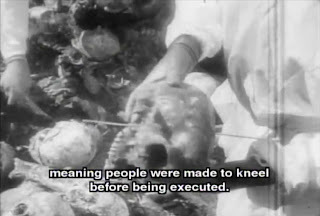 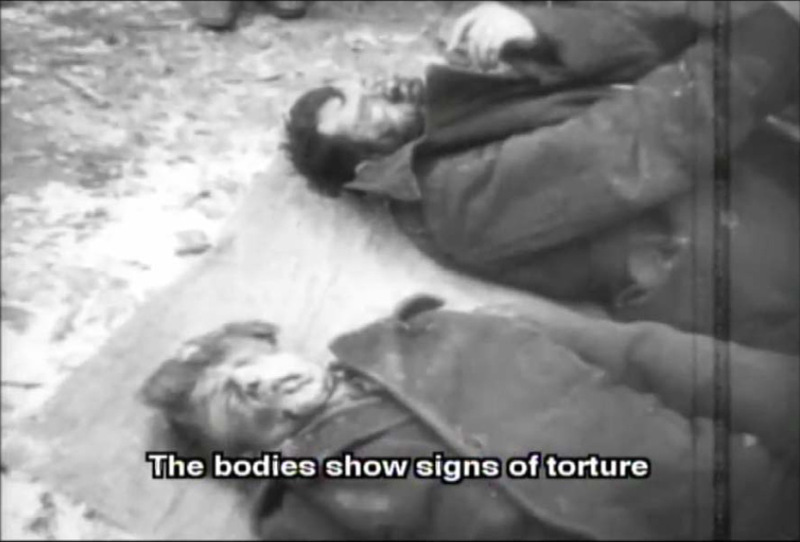 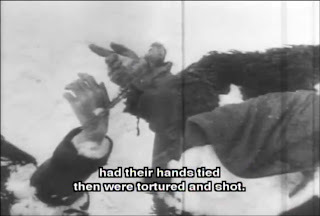 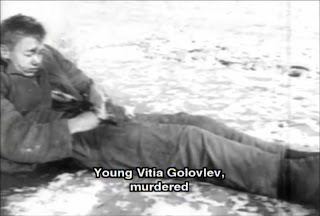 This part of the documentary is addressed in the third part of this series, while the first two parts are about those crimes shown in the documentary that were committed on Soviet territory. 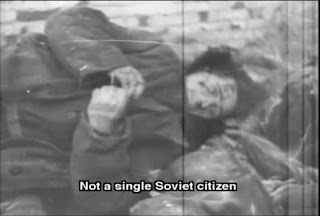 The images shown in this article are stills from the Soviet documentary, which can be enlarged by clicking on them. This is not recommended for sensitive persons as the images are sometimes very graphic. 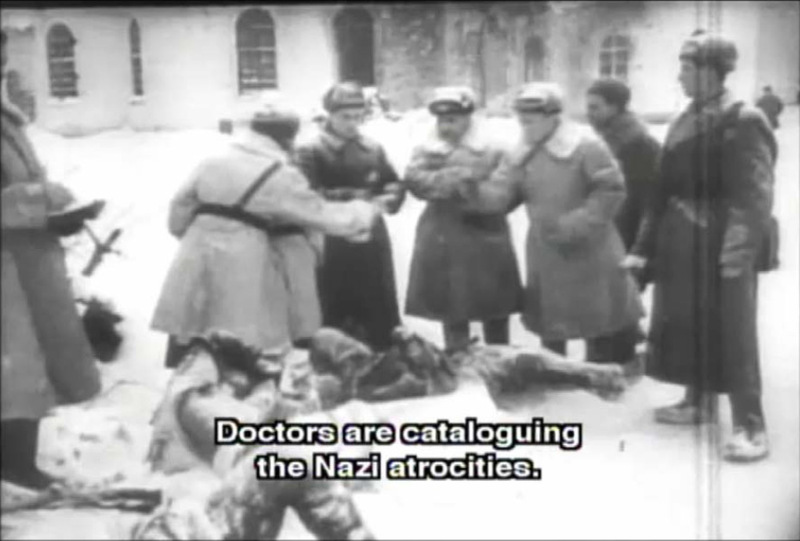 Like the documentary itself, they nevertheless show but a minuscule part of the crimes committed on Soviet territory by the Nazi invaders, and even of the crimes that occurred at the locations filmed – crimes against Soviet prisoners of war and civilians, Jews and non-Jews. The Jews among the murder victims shown are never referred to as such, presumably pursuant to the Soviet policy of not "dividing the dead" and not acknowledging that the Jews' fate under Nazi occupation was different from that of other Soviet nationalities. 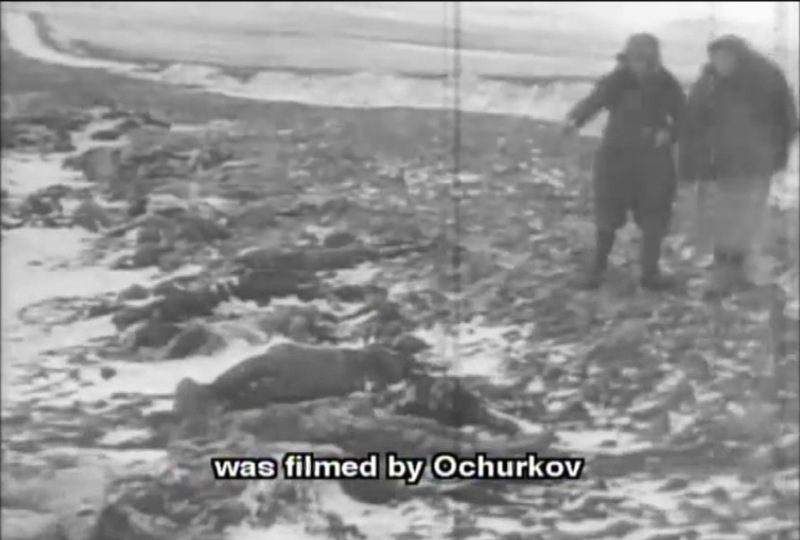 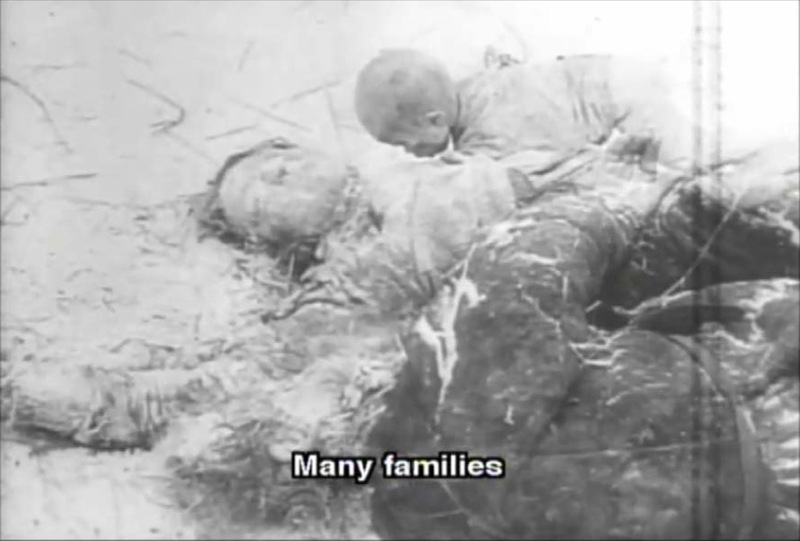 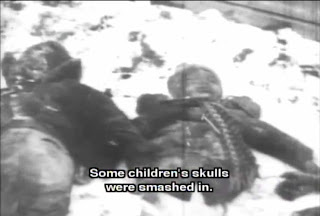 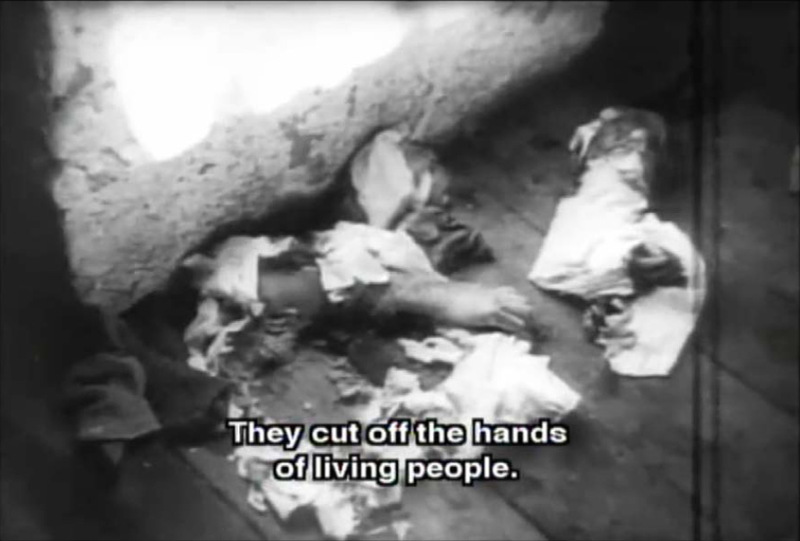 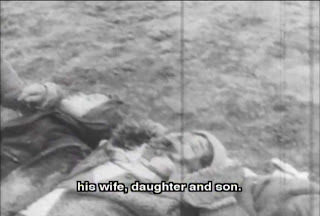 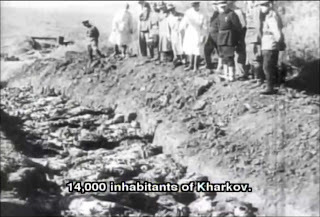 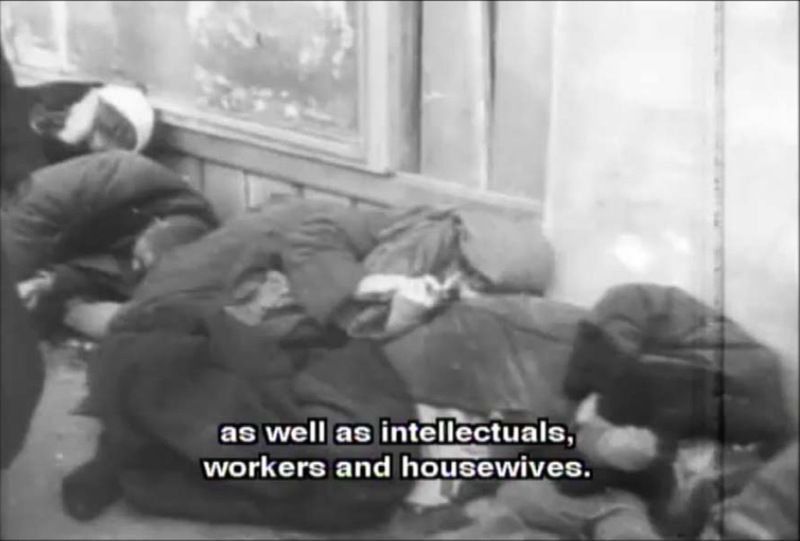 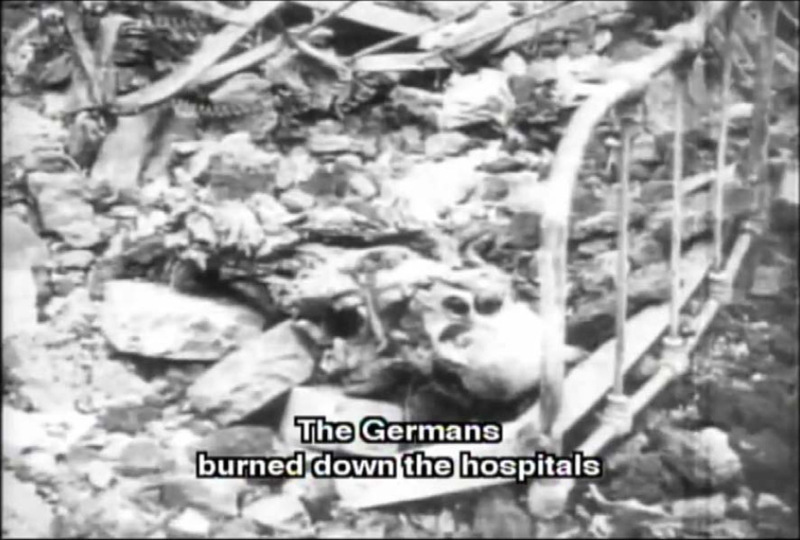 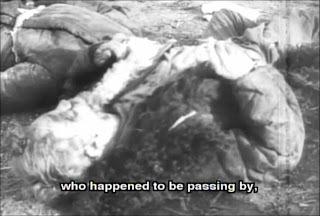 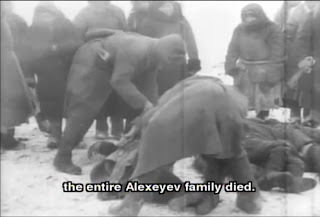 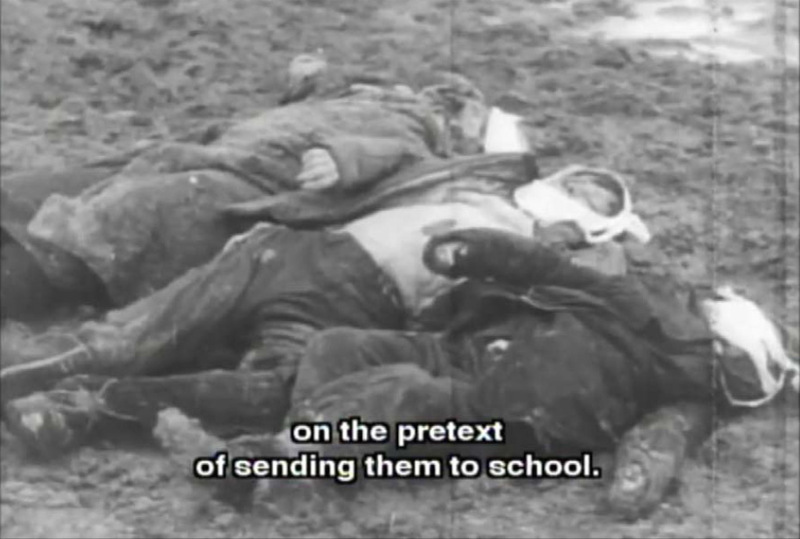 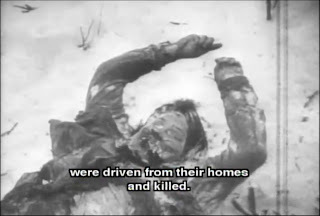 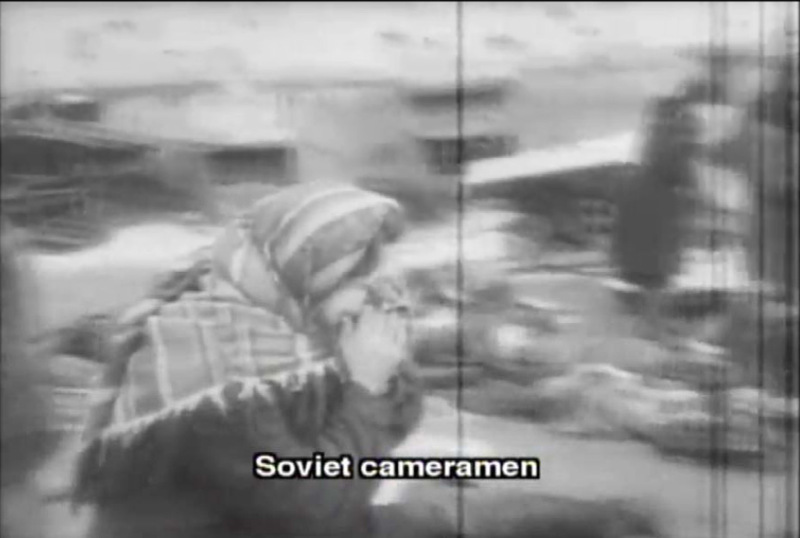 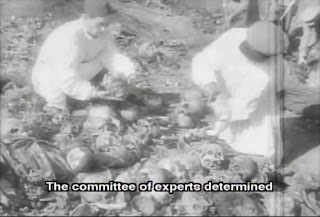 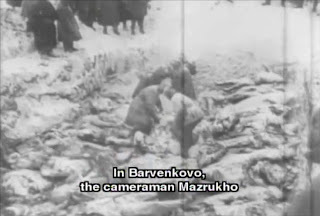 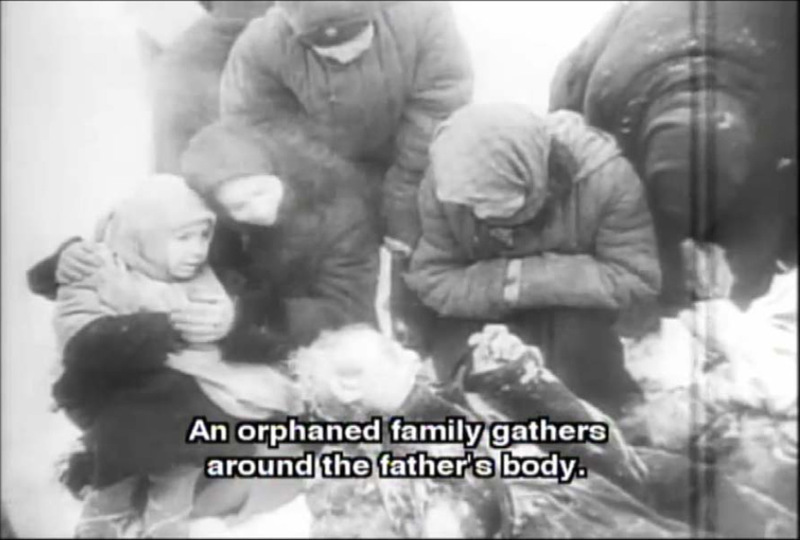 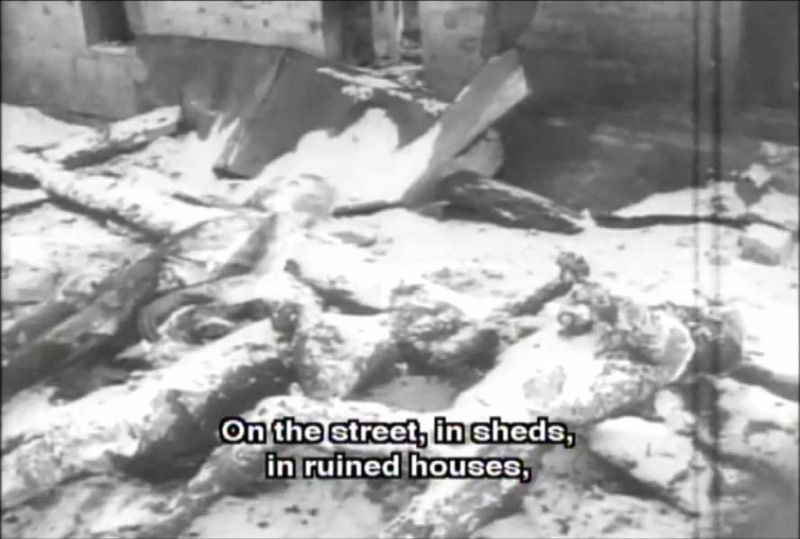 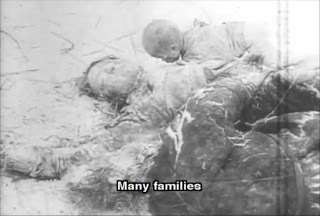 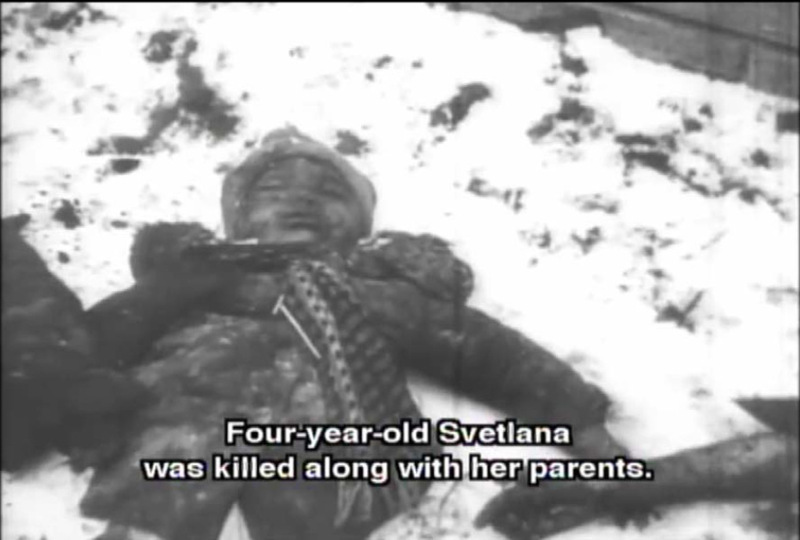 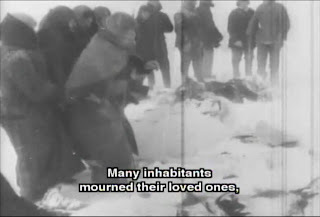 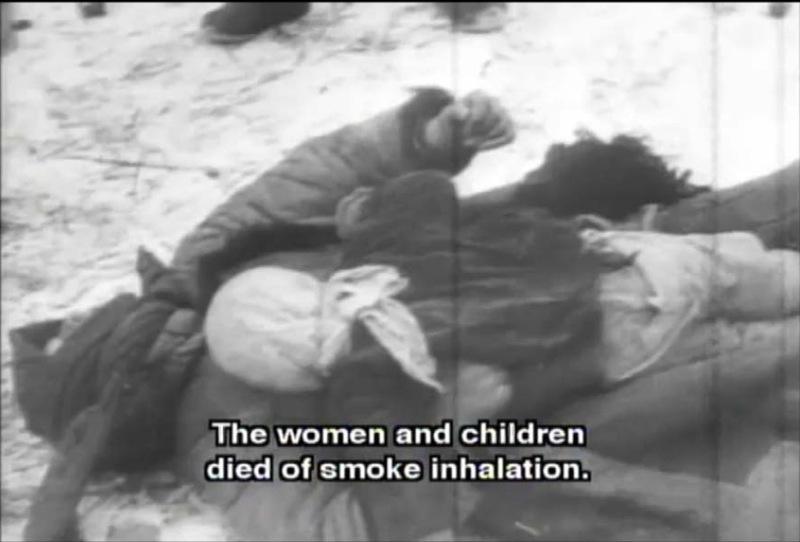 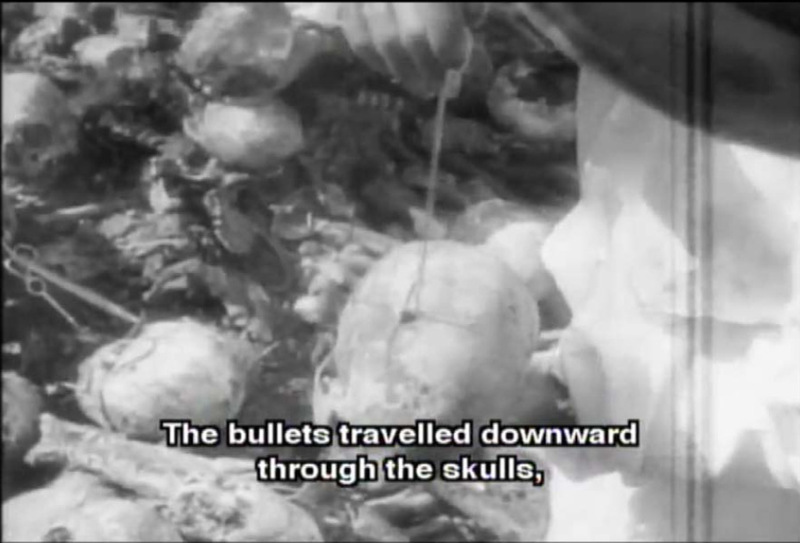 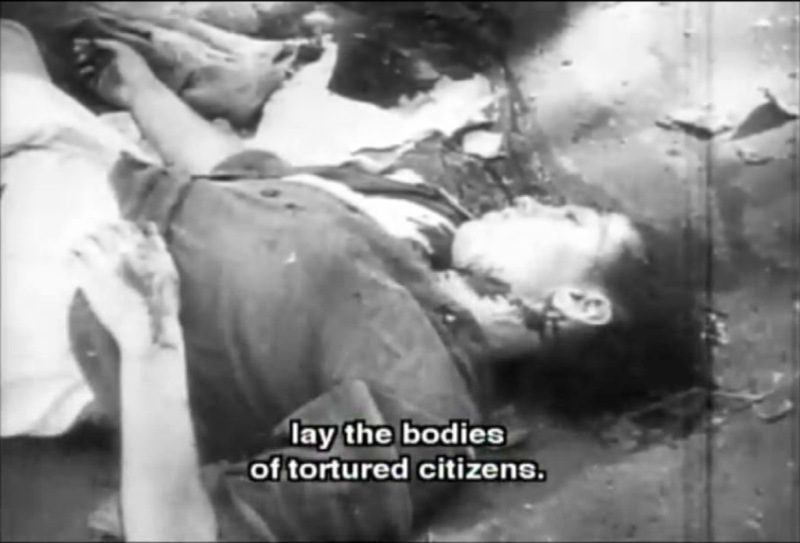 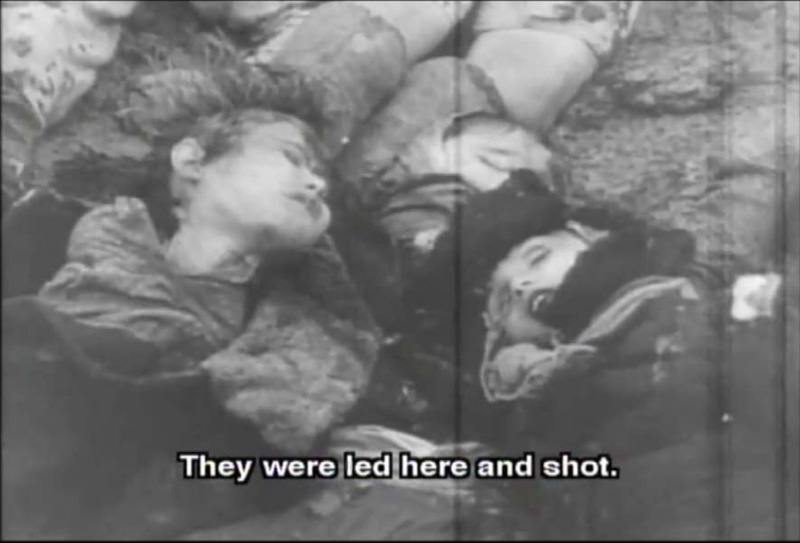 To the documentary's Soviet commentator, all civilian victims were simply "Soviet citizens". The commentator's information on the events that the documentary's images are meant to give an idea about must be regarded with the caveats that apply to information from belligerent powers in general and to Soviet information in particular, namely that it should be checked against sources independent of the Soviets, e.g. the contemporary German documents and later depositions before West German criminal justice authorities that German and some non-German historians draw on, before accepting it as a true and fair account of the events narrated. 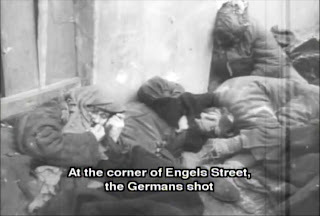 Where I could find further information about the events shown in the documentary, about their larger context or about similar events (especially such that happened at the places filmed), I have linked to or transcribed such information. 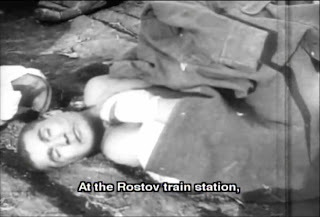 Rostov-on-Don changed hands twice during the Second World War. The German occupation lasted from November 21 to 29, 1941, and from July 24, 1942 to February 14, 1943. 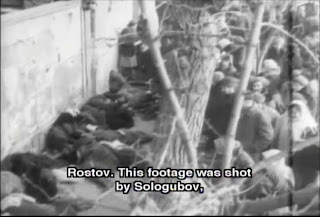 Rostov was among the 15 Russian cities that suffered the most during the years of occupation; it was also the largest Russian city seized by the German army. 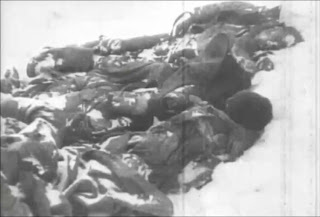 (Kommersant, Rostov Region). 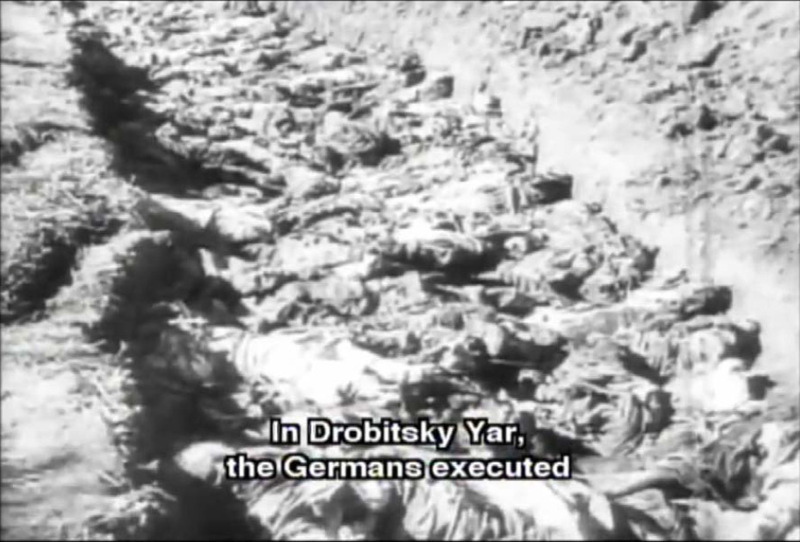 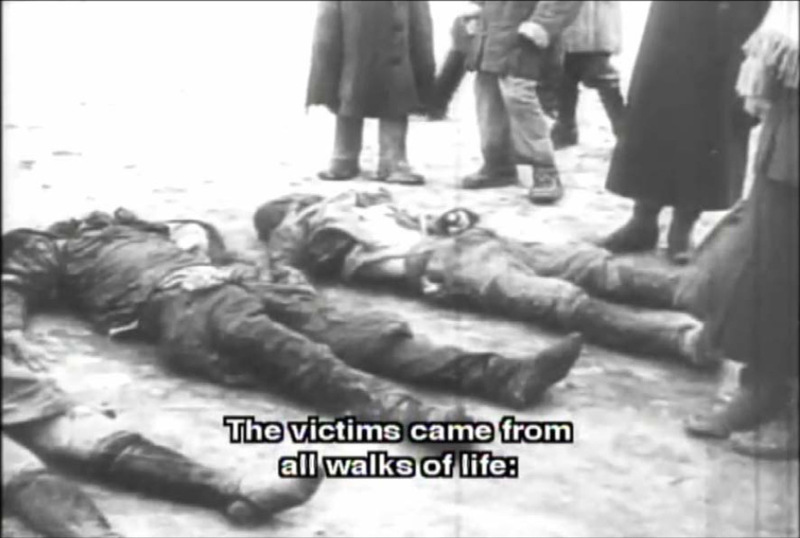 The Nazi blood lust at Rostov gained wide notoriety. 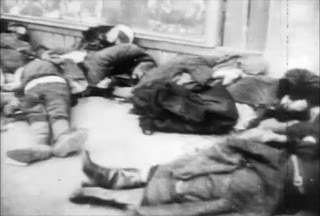 Having established themselves in Rostov for 10 days, the Germans murdered not only individuals and families, but in their bloody zeal annihilated scores and hundreds of residents, especially in the workers" districts of the city. Near the building of the railway administration, in broad daylight, the Germans shot down 48 persons with automatic rifles. On the sidewalk of a central street of Rostov, the Hitlerite murderers shot 60 persons. 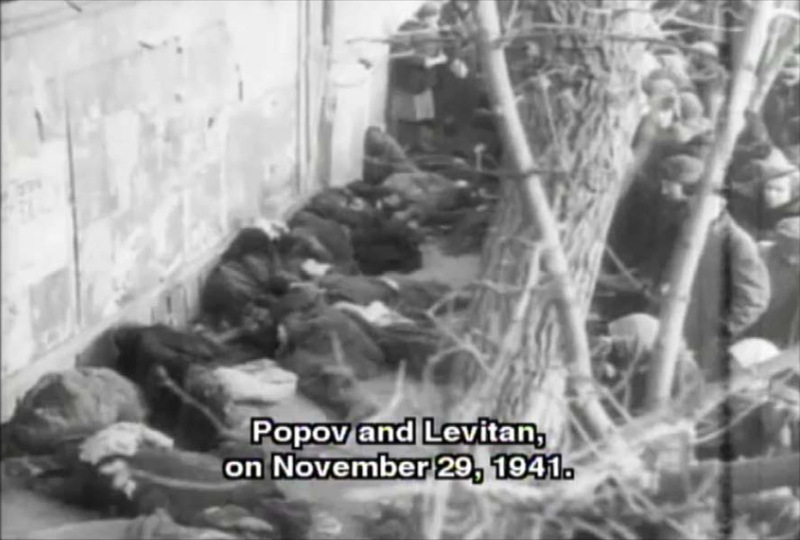 In the Armenian cemetery they killed 200 persons. Even after they were driven from Rostov by our troops, the German generals and officers publicly boasted that they would return for the specific activity of taking a bloody revenge on Rostov civilians who had actively helped to oust their sworn enemies from their native city. 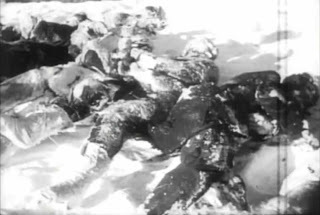 Despite the commencing heavy winter the 1st Panzer Army on the same day [5 November 1941] started its attempts to conquer Rostov, its troops being constantly exposed to massive Red Army counterattacks. 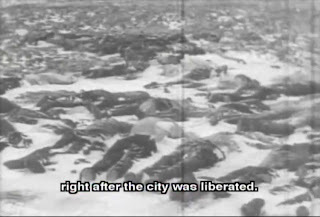 In a final tour de force the city was to be conquered before the transition to position warfare during the winter, in order to create good pre-conditions for continuing mobile operations in the spring of 1942, as according to Hitler’s ambitious plans Stalingrad and Maikop were to be taken after the turn of the year. 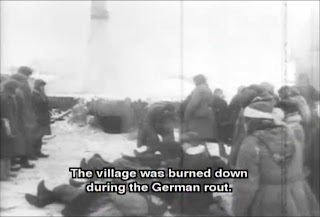 The heavy rainfalls, the muddy streets and the ground frosts setting in on 13 November 1941 hindered the mobility of the 1st Panzer Army, which had to be regrouped several times. 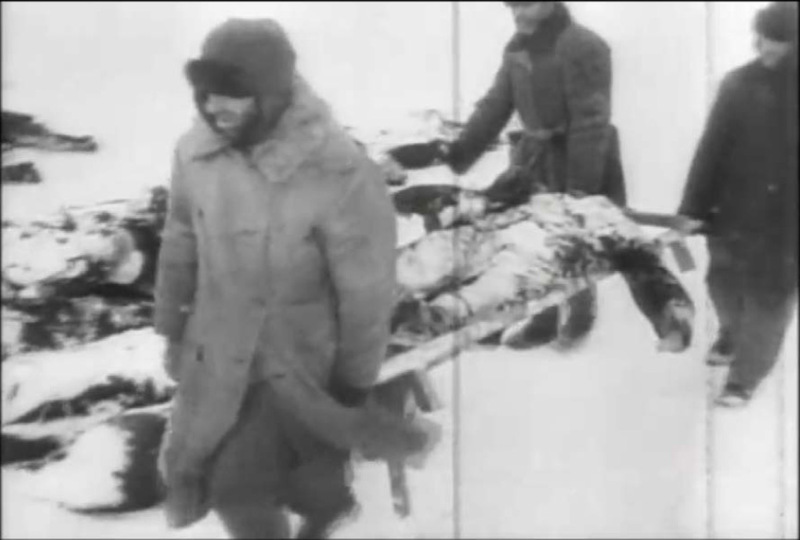 Yet on 21 November the III Panzer Corps stood in Rostov and the fight for every house began. 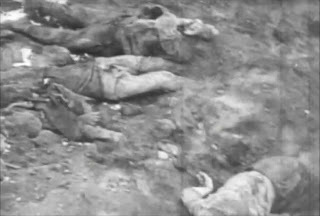 During the mopping-up of the combat zone and in the street fighting the frontline troops also gave no quarter, like in Nakhitshevan near Rostov, where »stragglers and partisans« were wiped out by the 60th Infantry Division »by the fiercest means«, including the use of flamethrowers. During the conquest of Rostov also the main detachment of Sonderkommando 10a followed the troops. 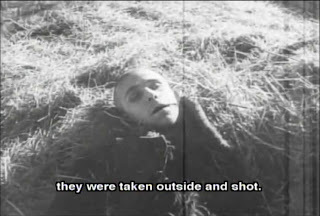 It was involved in fights with armed persons, after which Seetzen had 35 of »these nasty fellows« shot »on the spot«. Due to the Red Army’s counteroffensive, however, the detachment had to flee the city after a few days’ stay, leaving behind various service papers (including the personnel files), and get back to Taganrog with several wounded, as Rostov could no longer be held. 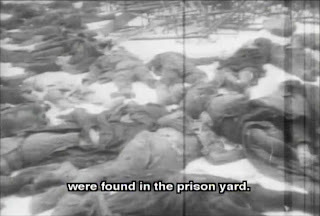 Regarding the treatment of Soviet prisoners of war in German captivity, see the blogs Notes from a Transit Camp, "... otherwise you’ll think that I’m bloodthirsty", Nazi persecution and mass murder of Jews and non-Jews and One might think that …, as well as the RODOH thread The Fate of Soviet Prisoners of War. 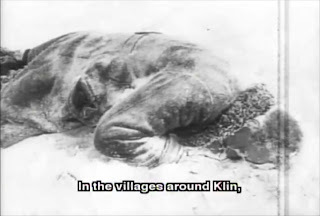 Tikhvin is a town and the administrative center of Tikhvinsky District of Leningrad Oblast, Russia, located on both banks of the Tikhvinka River in the east of the oblast, 200 kilometers east of St. Petersburg. 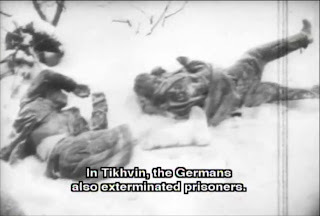 During World War II, Tikhvin was occupied by Nazi troops from November 8, 1941 to December 9, 1941. 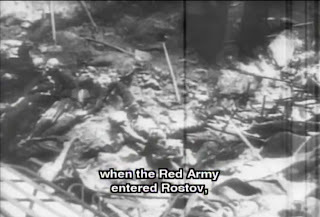 Due to counterattacks by Soviet forces, it had to be abandoned after one month, but many architectural monuments were destroyed during that time. 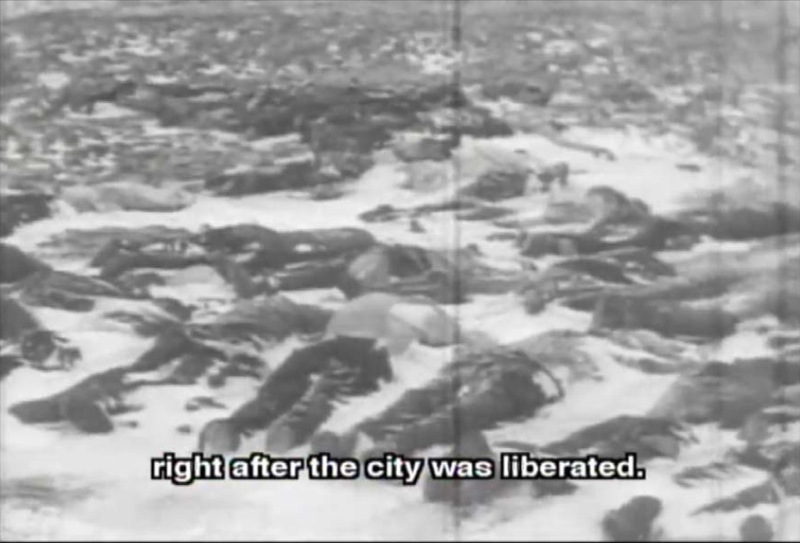 The re-capture of Tikhvin is considered to have been extremely vital in the execution of the "Road of Life" during the Siege of Leningrad, thanks to its railroad. It allowed the Soviets to provide much more foodstuffs in comparison to the makeshift land road previously used. A German officer described how shocked he and his soldiers had been when Russian civilians had cheerfully stripped the corpses of their fellow countrymen. 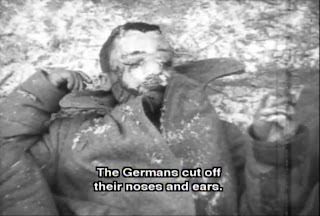 Yet German soldiers were taking clothes and boots from living civilians for themselves, then forcing them out into the freezing wastes, in most cases to die of cold and starvation. Senior officers complained that their soldiers looked like Russian peasants, but no sympathy was spared for the victims robbed of their only hope of survival in such conditions. 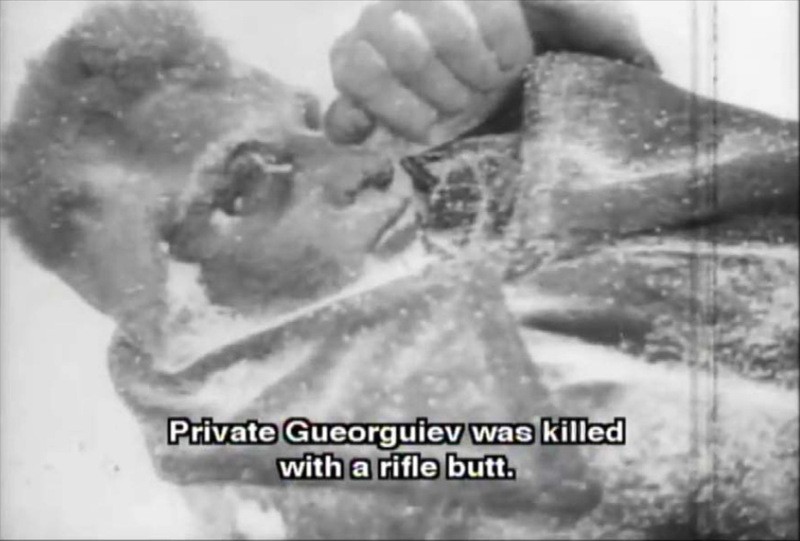 A bullet might have been less cruel. During the retreat from Moscow, German soldiers seized any livestock and food supplies on which they could lay their hands. They ripped up floorboards in living rooms to check for potatoes stored underneath. Furniture and parts of houses were used for firewood. Never did a population suffer so much from both sides in a war. Stalin had signed an order on 17 November ordering Red Army units – aviation, artillery, ski-troops and partisan detachments – to 'destroy and burn to ashes' all houses and farms for up to forty miles behind the German lines to deny the enemy shelter. The fate of Russian women and children was not considered for a moment. 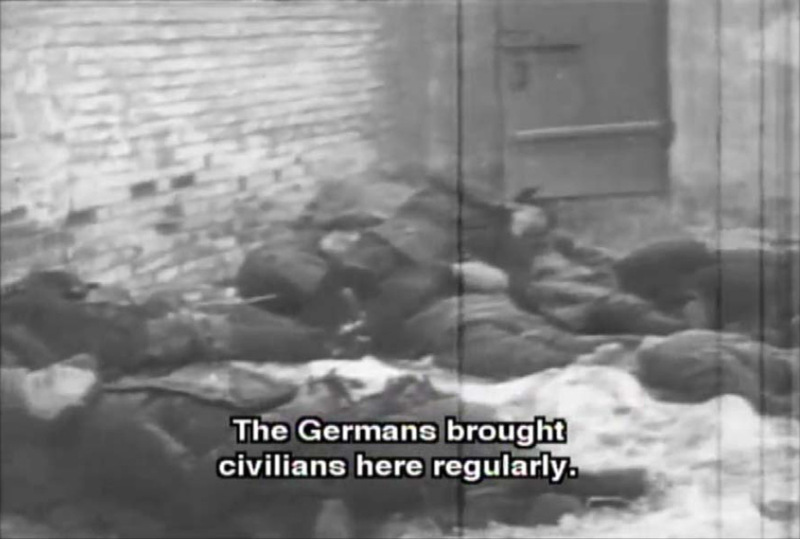 In his recent book Wehrmacht im Ostkrieg: Front und militärisches Hinterland 1941/42, German historian Christian Hartmann mentions the German practice of using civilians as "scouts" and then killing them so they would not reveal the German positions to the enemy (page 774). While all retreating German formations thoroughly devastated the areas they left behind, the 4th Panzer Division proceeded with particular brutality, burning village after village, "killing the inhabitants who tried to fight the fire and with temperatures of 40 degrees below zero chasing the remaining population into the woods, that is into certain death", according to a letter written by the head of the division’s general staff to XXXXVII Panzer Corps on 20.3.1942 (Hartmann, as above; the letter is kept in the archives of the Institut für Zeitgeschichte). 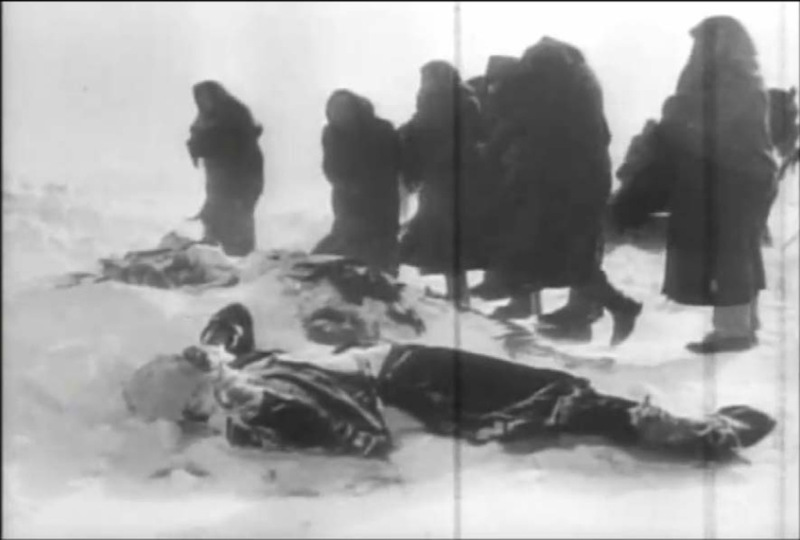 Hartmann writes that never before – except as concerns the starving Leningrad area – the German conduct of war had had such terrible consequences for the Soviet civilian population as during the retreat from Moscow (as above, p. 776). 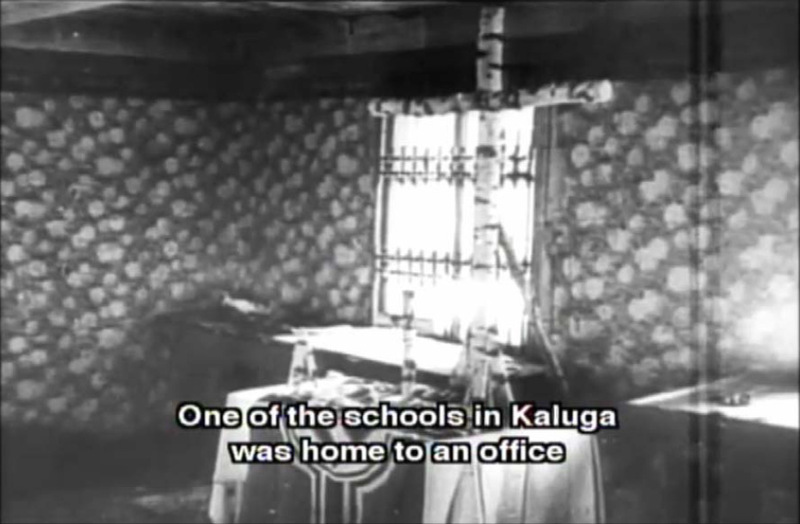 Kaluga is a city in western Russia, located on the Oka River 150 km southwest of Moscow. 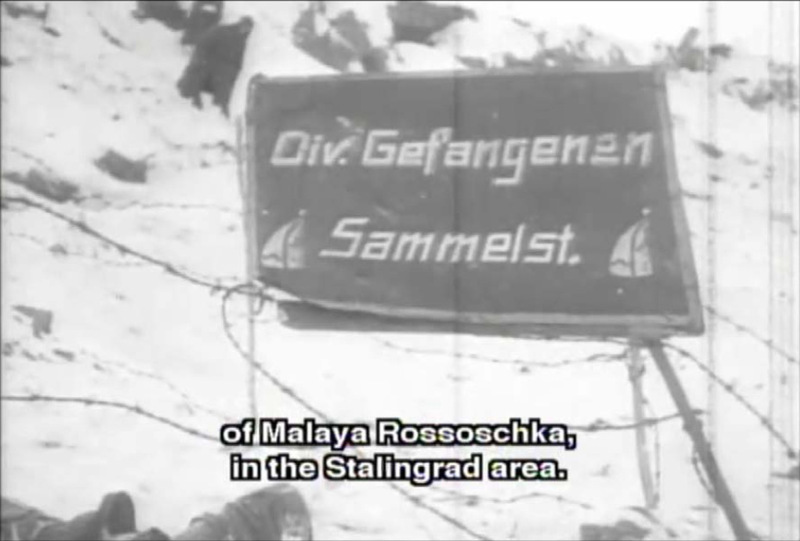 It was briefly occupied by German troops in 1941. 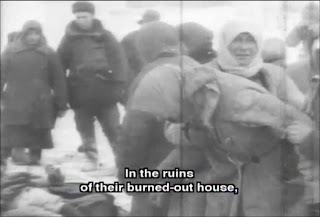 According to German historian Christian Gerlach (Kalkulierte Morde, 1999 Hamburger Edition, p. 296), 75,000 people were living in Kaluga when the city was occupied by the Germans in early November 1941. The economic department (Gruppe IV Wi) of the Army Rear Area Commandant (Korück) 559, having learned from the city administration that due to the destruction of some factories there were 10-12,000 workplaces at most and that even after the industry’s reconstruction the city could not occupy its population, reported that the population had to be reduced by 35,000 persons because otherwise the "booty supplies" would last only three instead of six months. Thereupon more than 20,000 people were evacuated from the city, if nothing worse happened to them, so that on 20 November 1941 Kaluga had only 48,000 inhabitants. 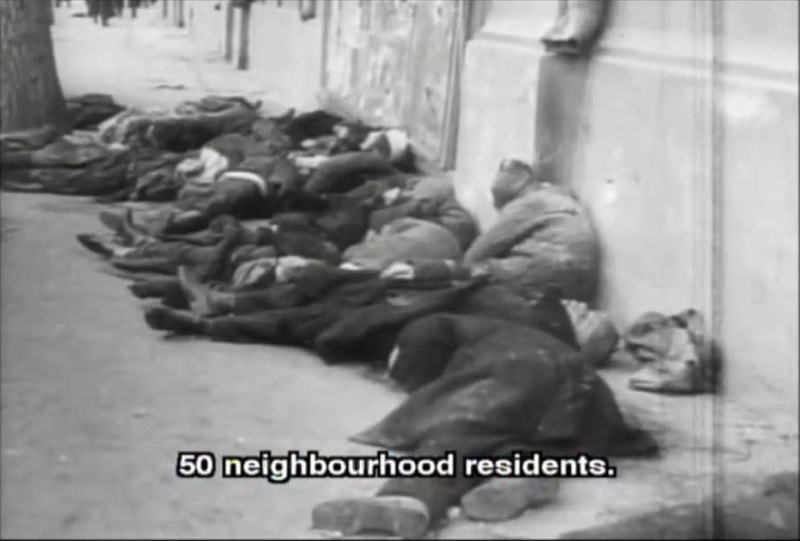 135 Jewish families were placed in a ghetto, and over 900 communists were obviously murdered. The Gestapo prison in Kalinin only operated for one month, from 15 November to 15 December 1941. 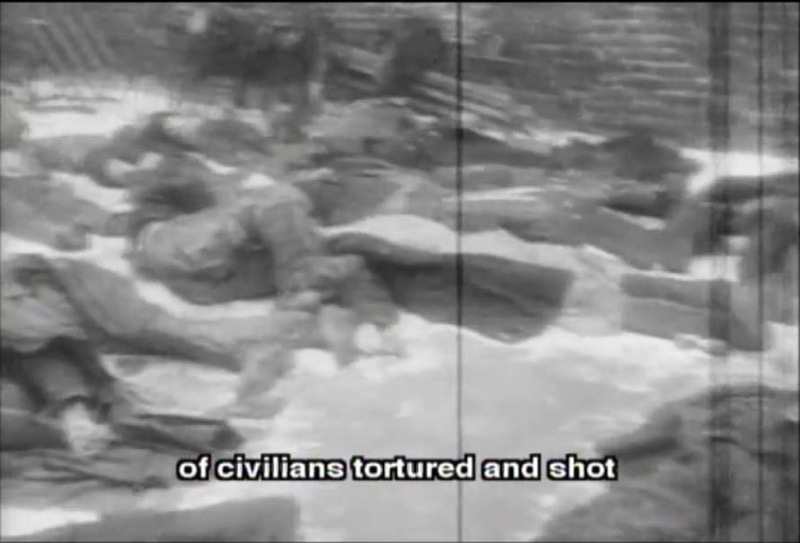 In this period 340 detainees were shot there during interrogations. 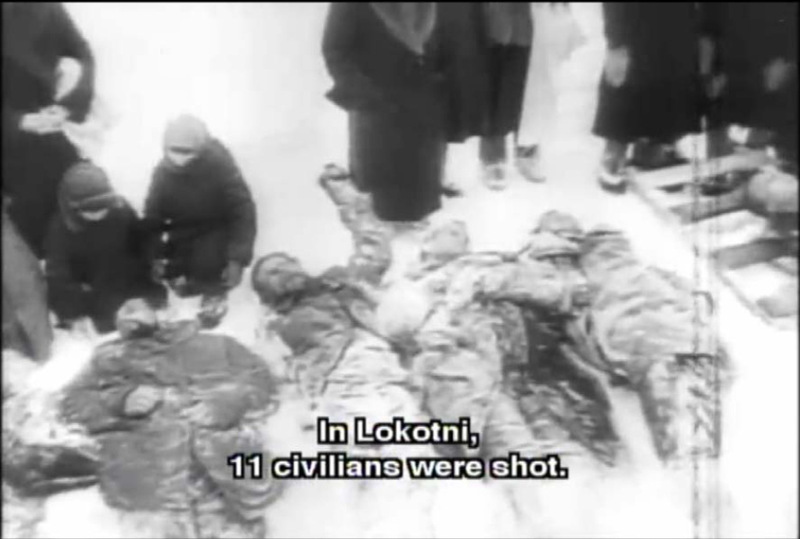 11 each day. 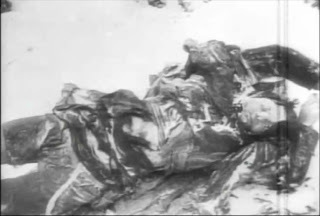 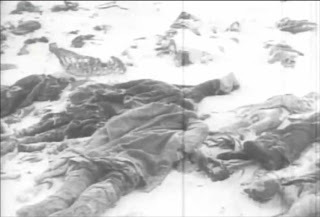 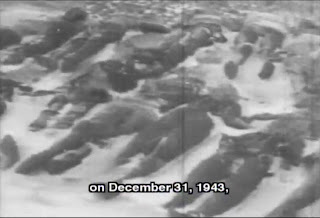 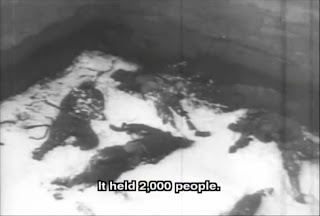 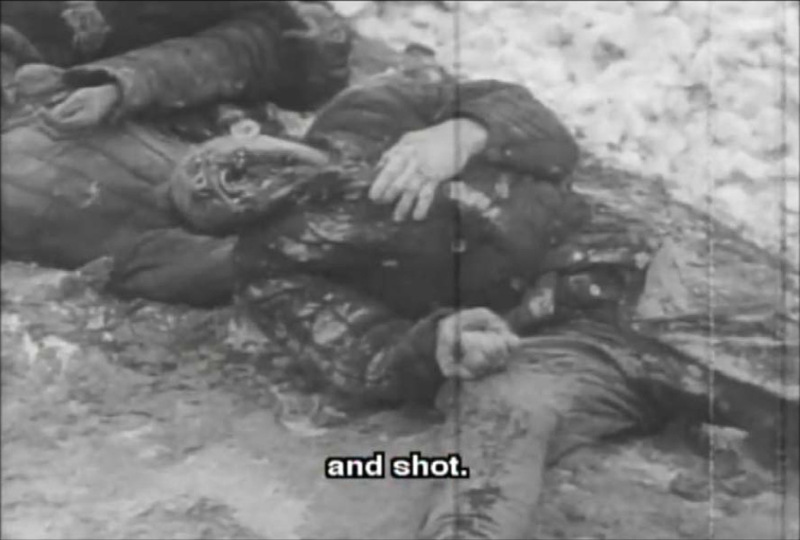 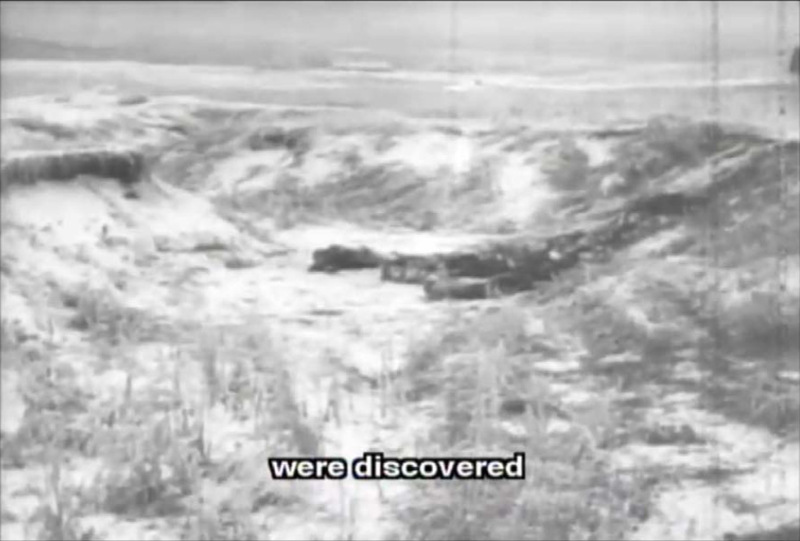 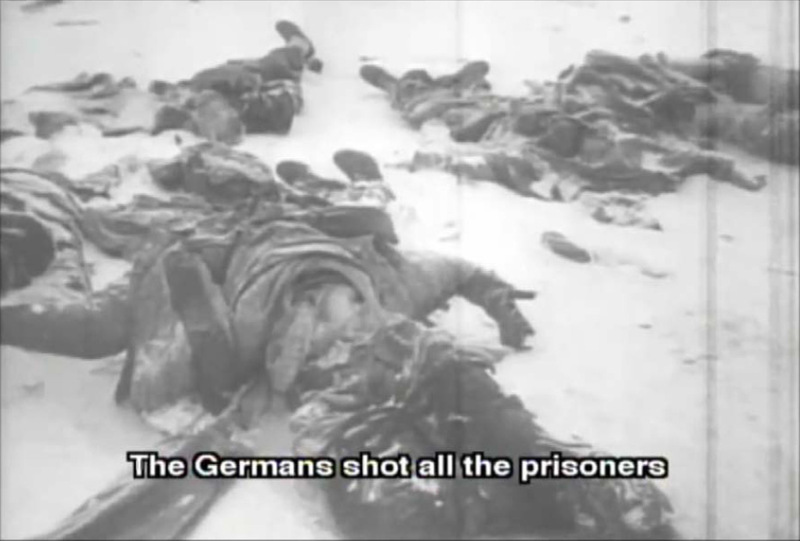 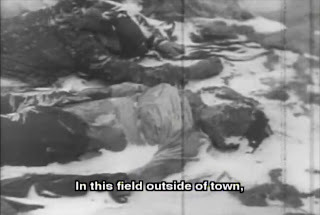 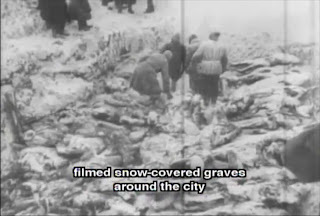 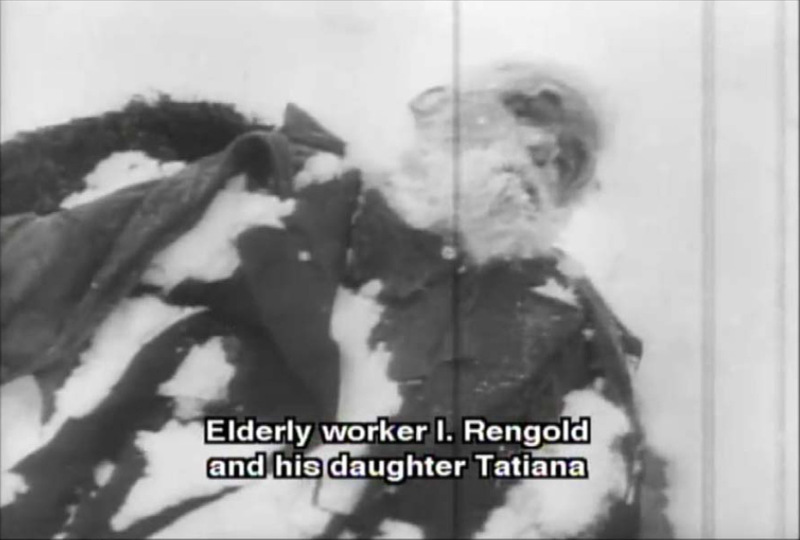 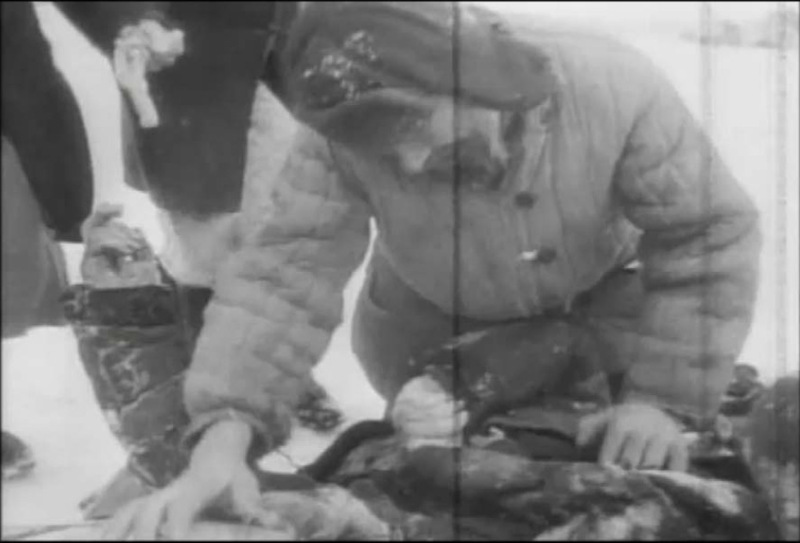 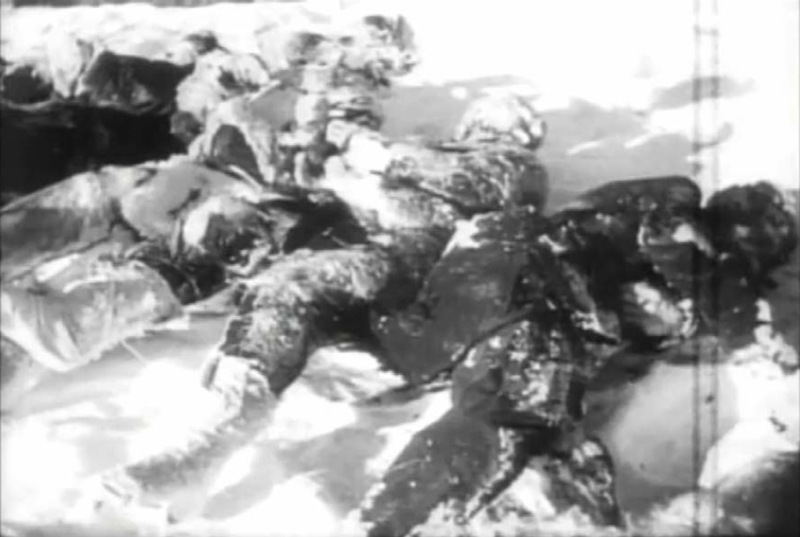 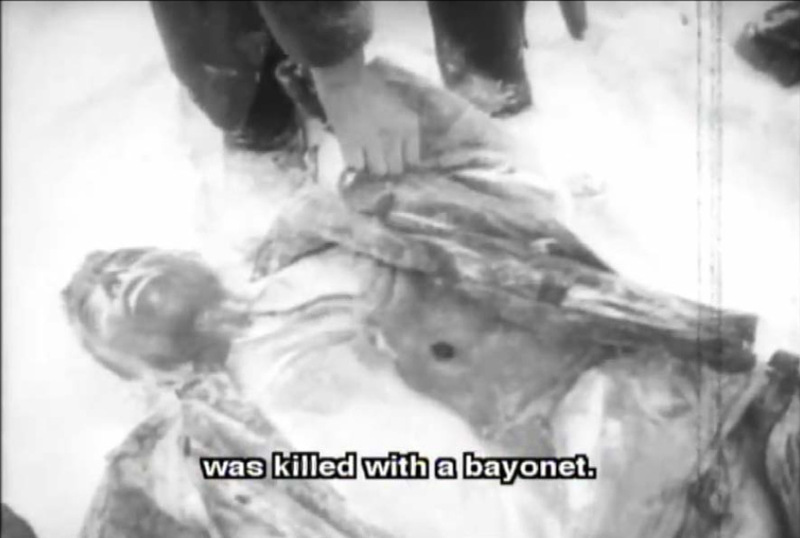 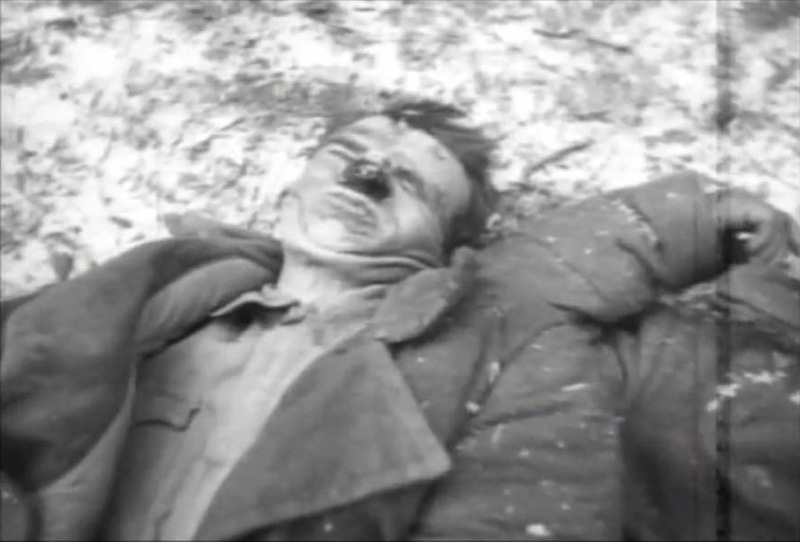 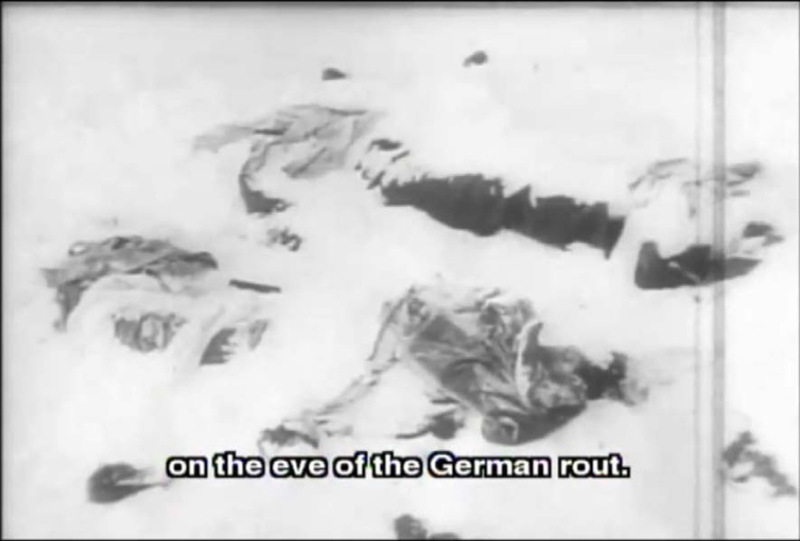 The corpses of the 340 shot were hidden in the snow by the Gestapo or shoved underneath the Volga’s ice cover. After the city's liberation six persons were found alive in the prison. […]Another cellar, somewhat bigger: here they tortured. 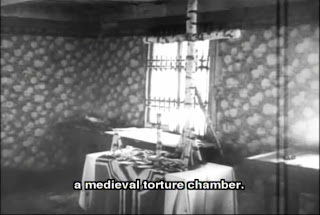 Despite the thick walls and ice doors the screams of the tortured were audible in the other cells. On purpose, to intimidate those waiting. 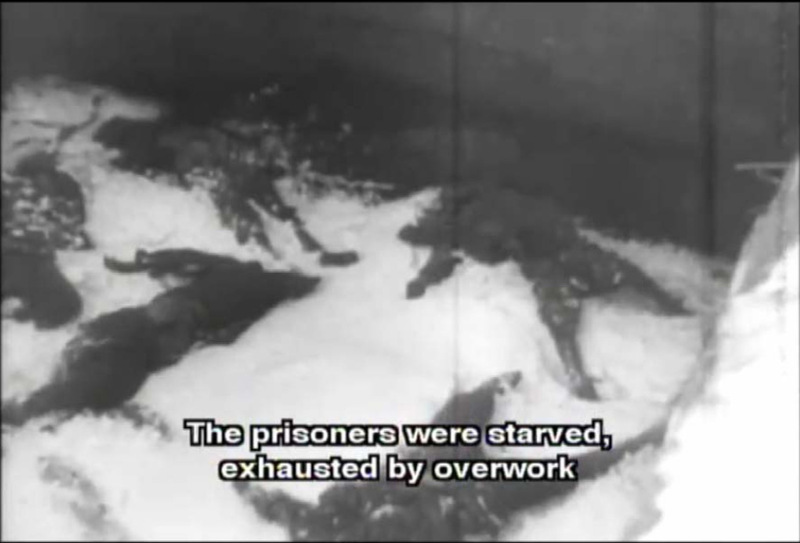 Here the prisoners were beaten with metal whips until they fainted. Their eyes were poked out, articulations dislocated, noses and ears cut off. Some inscriptions can still be seen on the walls. 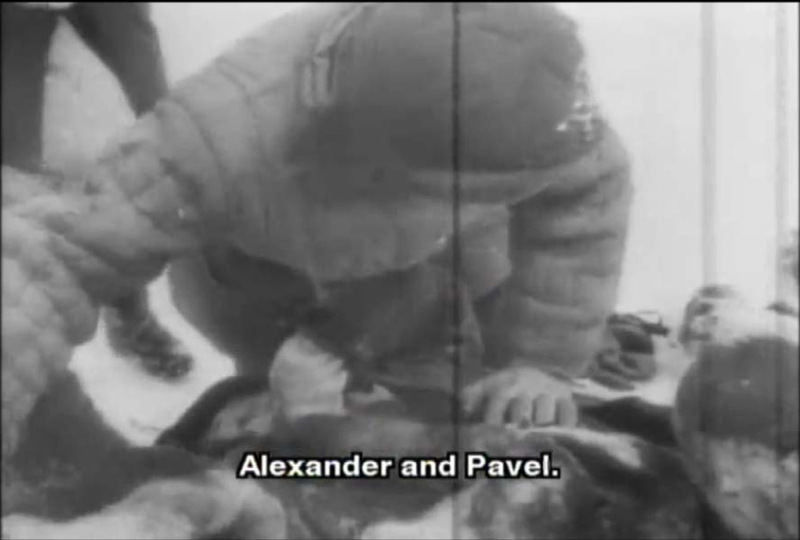 Dates and names scratched into the stones. 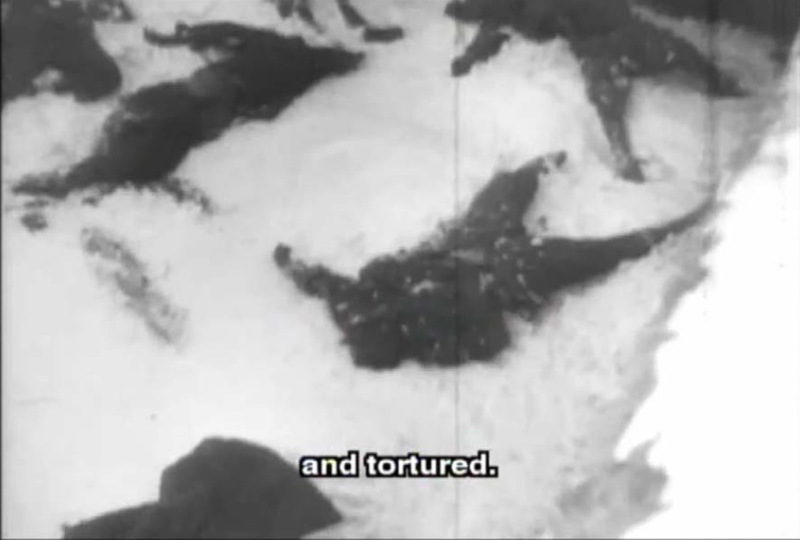 Mute screams. 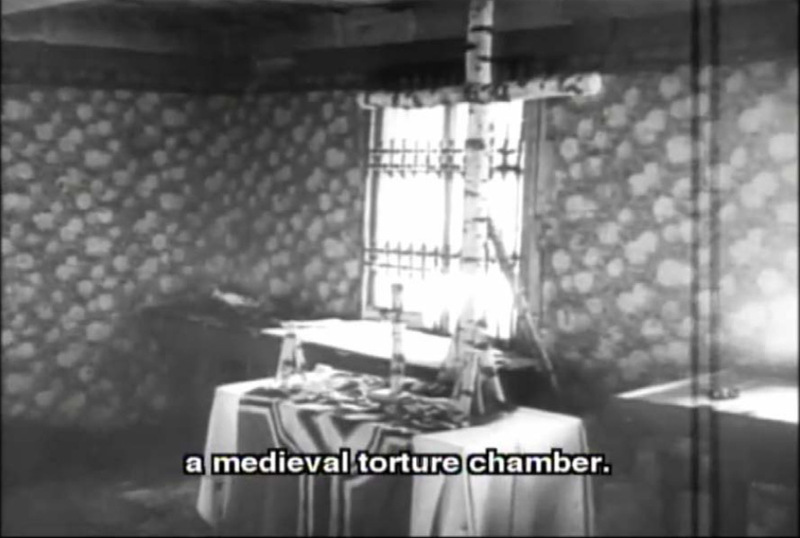 I'm glad to get back upstairs into the open air. According to preliminary figures, about 7,000 persons were killed by the German fascist bandits in Kerch. 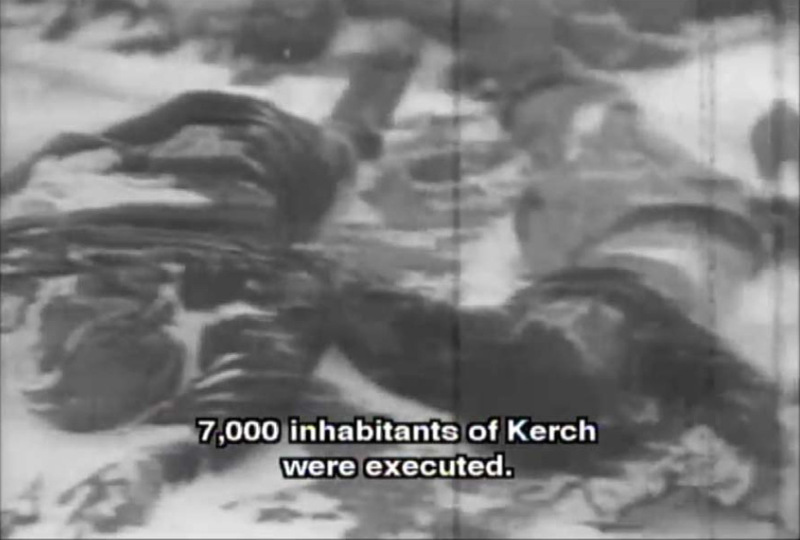 The following is my translation of Andrej Angrick’s description of a mass execution of Kerch Jews in early December 1941 (Angrick, Einsatzgruppe D, pp. 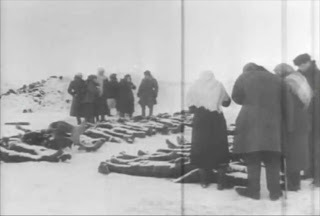 356-358). 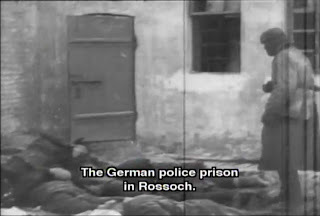 In the usual manner Sonderkommando (Sk) 10b took over the prison, in order to turn it into a collection point for the Jews until their execution. This time the special detachment was under time pressure, as the [Wehrmacht] local headquarters already reported to the Army Rear Area Commander that the liquidation of the Jews would be »carried out at an accelerated pace due to precarious food situation in the city«, although at this time not even the registration had been completed. The local headquarters acted on the assumption that of the 50,000 people remaining in the city 15 per cent were Jews, i.e. that it would soon have to feed 7,500 people less. 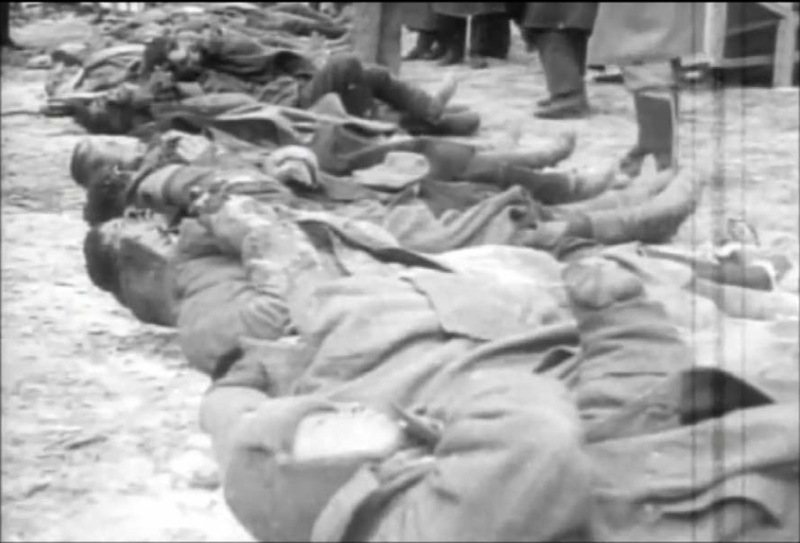 On the first three days of December the »resettlement« of 2,500 Jews was carried out, the rest remained in hiding as it had meanwhile been informed about the task of Ohlendorf's flying detachment. 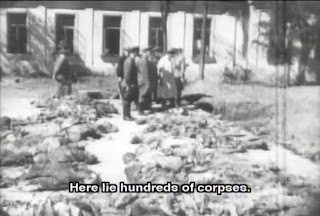 The murder of 2,500 people could barely be carried out by the small partial detachment on its own. 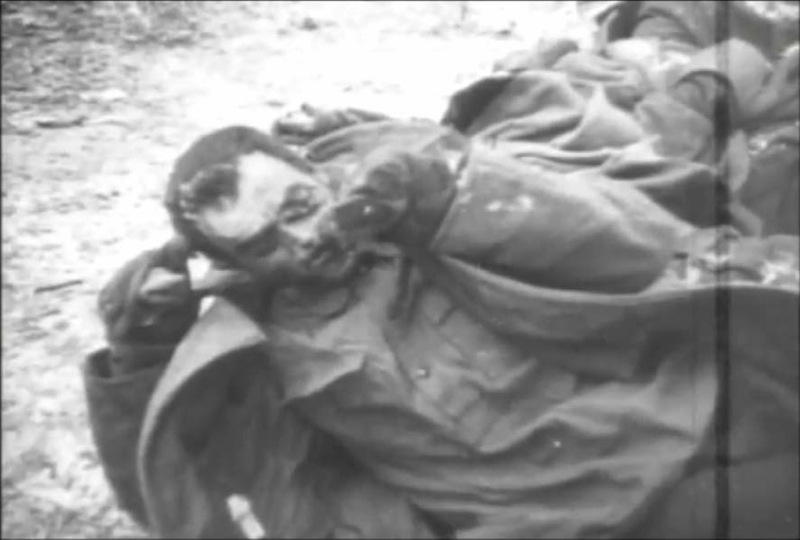 Additionally the partial detachment commander Finger seems to have been close to a nervous breakdown. But the local headquarters in this situation did not deny the special detachment its assistance. 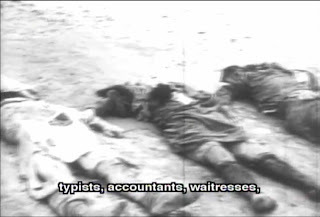 It undertook not only to organize the transport of the Jews and the execution site’s sealing-off, but also to make available additional marksmen (who probably belonged to the 46th Division). 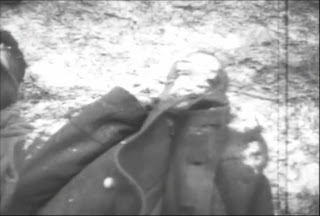 Ammunition for the execution also came from the Wehrmacht; big boxes stood near the anti-tank ditch, and every marksman could get what he needed, regardless of where he shot with a rifle or a machine pistol. During a joint dinner with members of the 46th Infantry Division Finger had furthermore on his own initiative invited a Wehrmacht soldier, telling him that if he had »good nerves« he could come to the execution site to see how some »2,000 Jews are shot«. 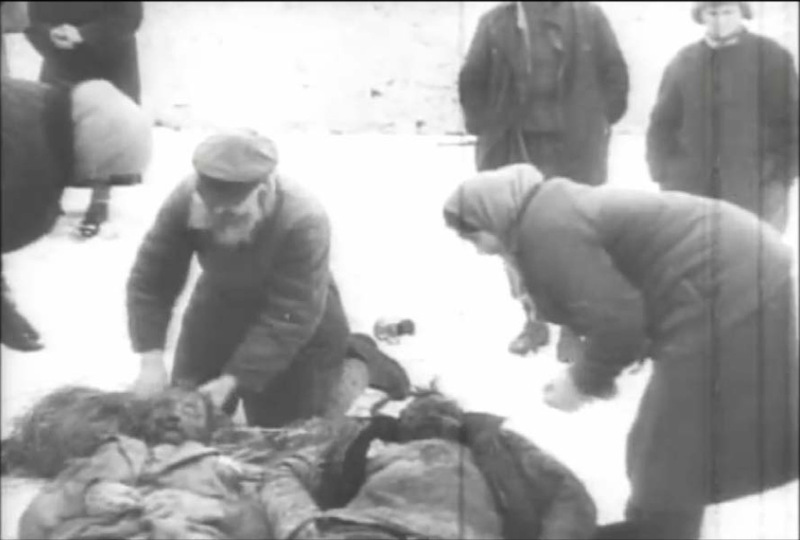 Despite the decree that forbade Wehrmacht soldiers to enter the execution site this man got on his way following Finger’s invitation, as he wanted to make certain whether »actually such large number of Jews« would be killed. At a temperature of minus 20 degrees trucks brought the victims to the execution site, where auxiliaries – so-called Hiwis - spurred them on with clubs. 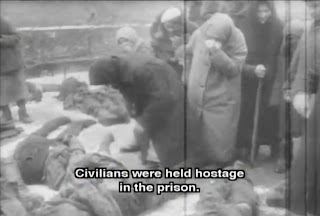 At the collection point the prisoners were deprived of money, watches and other valuables, their upper clothes were torn off their bodies, and particularly pretty children's shoes were also taken away from them. 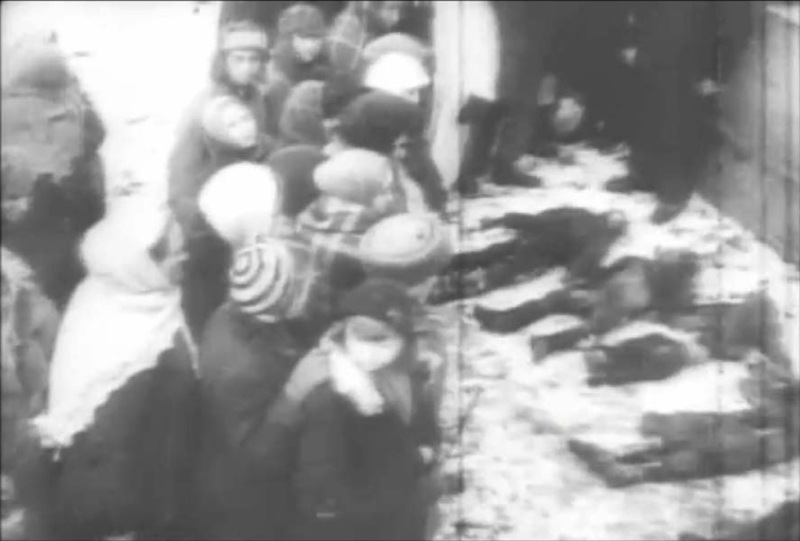 Offside the place where the trucks stopped there were large heaps of clothes, furs, children's shoes, caps and watches. 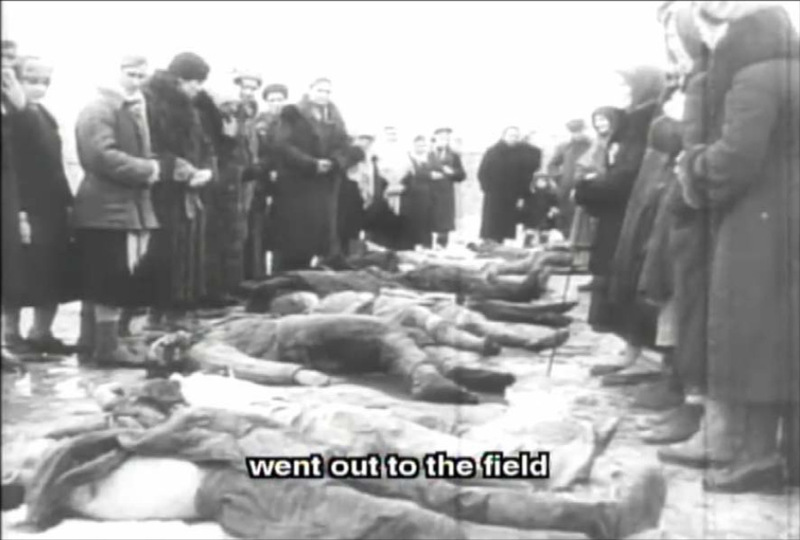 Some of the people, who already guessed what would happen, started to wail, the older ones put their hands together and looked up to the sky. 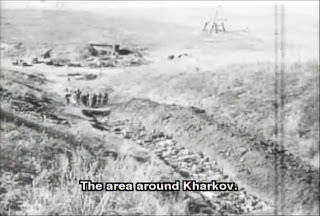 Barvenkovo is a location in Kharkivs'ka Oblast, Ukraine. The Barvenkovo area was the site of major military action during the Second Battle of Kharkov. 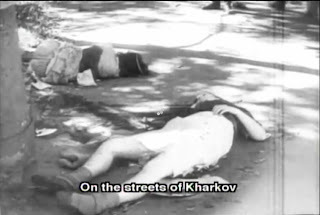 A Yad Vashem killing sites catalogue for the Kharkov region contains the information that in 1942 several Jews who remained in the town of Barvenkovo were shot to death. The location in which the above scenes were filmed is probably Sofino in Poltavs'ka Oblast', Ukraine. Sk (Sonderkommando)10b advanced from Temryuk to the Taman Peninsula, crossing the conquered territory in a southeasterly direction, to the immediate frontline at the Terek river, In Prokhladny and Mosdok Pesterer left partial detachments, while he and his staff chose Nalchik as command post. While the documentation about the local activity of Sk 10b is extremely insufficient, perpetrators admitted that in these places they also carried out executions, albeit on a much smaller scale. Thus they testified about the shooting of Jews and partisans on the country road between Prokhladny and Mosdok as well as the annihilation of the Jews left in Nalchik – mainly old people, women and children. Under Persterer’s command there had already been an execution in Nalchik at the end of December 1942. Now that the evacuation was imminent the prisoners locked up in the detachment’s prison and the Jews still living in the city were to be murdered. The victims were at least 40 men, women and children who, clad in thick fur coats, were forced onto the waiting trucks. A common saying before the execution squad was put together is resported to have been »You go to the anti-tank ditch.« The marksmen thereupon knew that the victims were certain to be Jews. Also on 1 January 1943 the trip was to an anti-tank ditch outside the city. 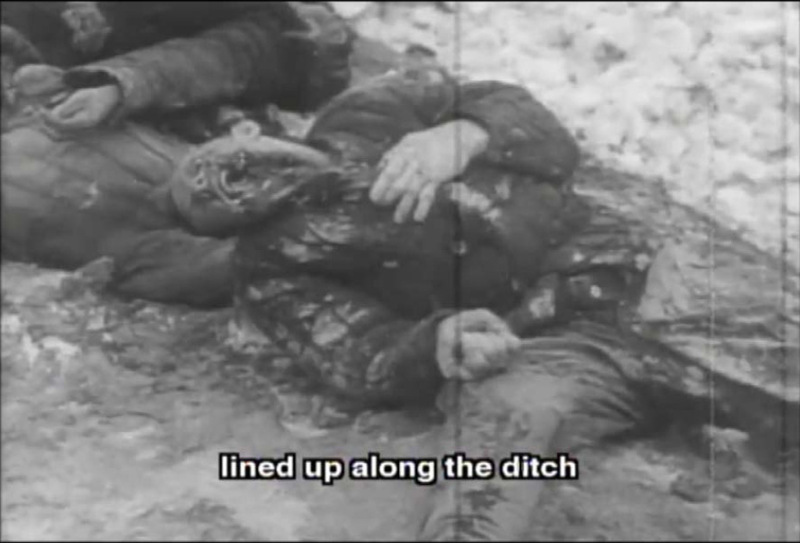 From the ditch emanated a sweetish smell of decomposition. A closer look revealed that in the ditch lay the uncovered, already decomposing corpses from the last shooting. Some of the SD-men examined the furs of the victims – the people now standing by the ditch, who had to stand or lay on the corpses inside to receive the deadly shot. 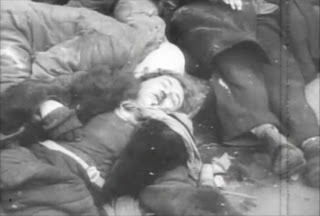 The shooting of the last Nalchik Jews lasted about half an hour; thereafter the furs lying in a heap were distributed among the detachment's members. Upon returning from the execution the detachment command allowed unrestricted booze consumption in the lodgings. 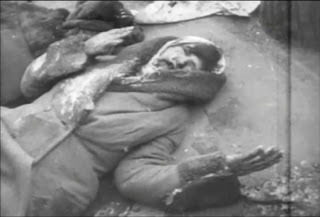 After all the store was filled with supplies that were not to be left to the approaching Red Army. 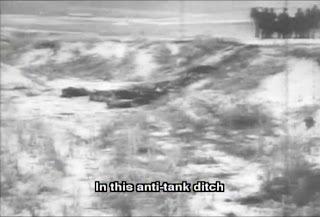 The main detachment’s cars moved out to the north after Nalchik had been prepared for demolition. 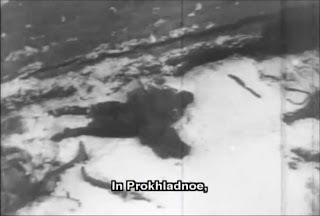 The location Prokhladnoe, to which the above documentary scenes refer, could be a place called Prokhladnoye in Luhans'ka Oblast, Ukraine, or a place by the same name in the Kabardino-Balkar Republic of Russia. 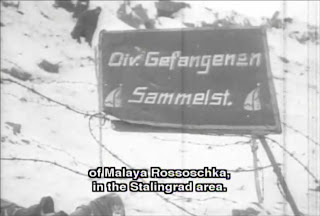 The Malaya Rossoschka prison camp was in the Stalingrad region. 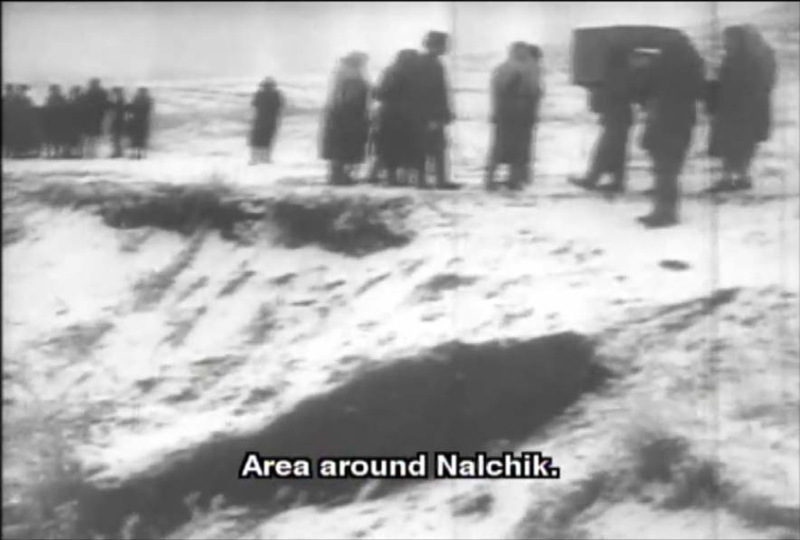 A place called Rossoschka lies by a river of the same name 37 km northwest of former Stalingrad (now Volgograd). 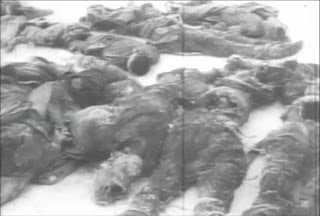 It has a huge military cemetery, close to an older cemetery near the former Gumrak airport, that will reportedly harbor 40-50,000 dead from the battle of Stalingrad after completion. During this retreat, German infantry divisions found themselves in the open fighting off cavalry attacks 'as if it were 1870', as one officer put it. Their greatest problem was transport, mainly because of the shortage of horses. In some cases the solution adopted was brutally simple. 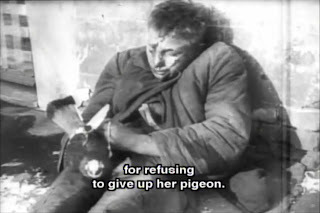 An NCO would grab three-quarter-starved Russians from one of the prisoner-of-war cages to serve as draught animals. 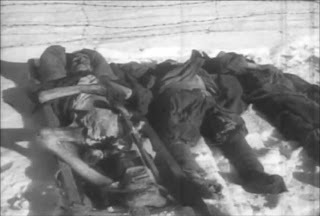 'When the retreat started on 20 November,' reported one Russian prisoner of war, 'we were put instead of horses to drag the carts loaded with ammunition and food. Those prisoners who could not drag the carts as quickly as the Feldwebel wanted were shot on the spot. 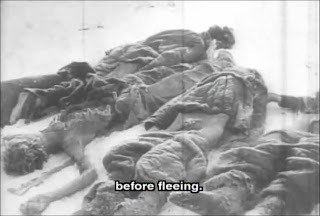 In this way we were forced to pull the carts for four days, almost without rest. At the Vertyachy prison camp, an encirclement of barbed wire without any shelter, the Germans selected the least unhealthy prisoners and took them with them.' The remainder, the sickest prisoners, were left behind to starve and freeze in the snow. 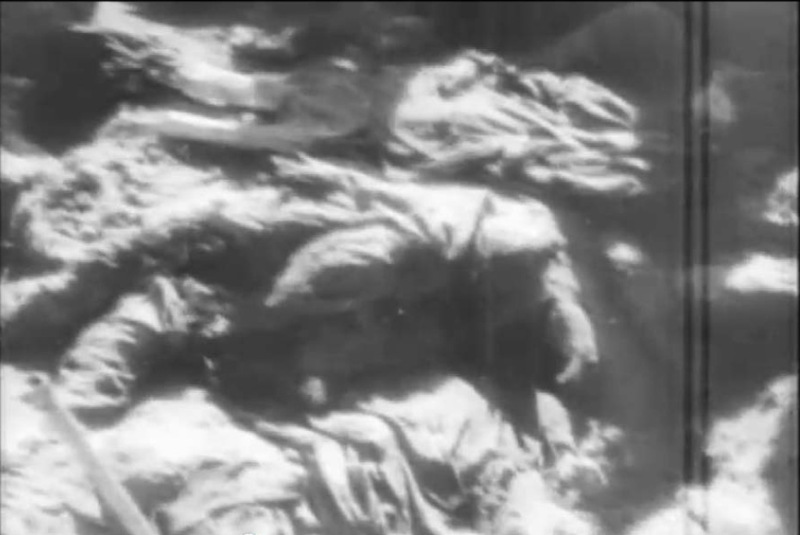 'Only two out of ninety-eight were still alive', when they were discovered by an advance unit of the 65th Army. 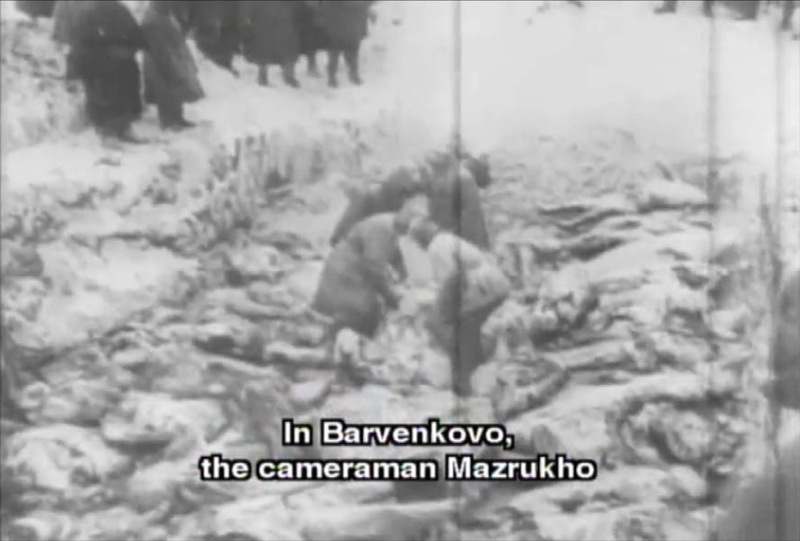 Photographers were summoned to record the horrific scene. 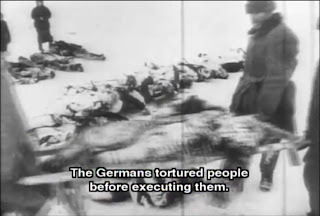 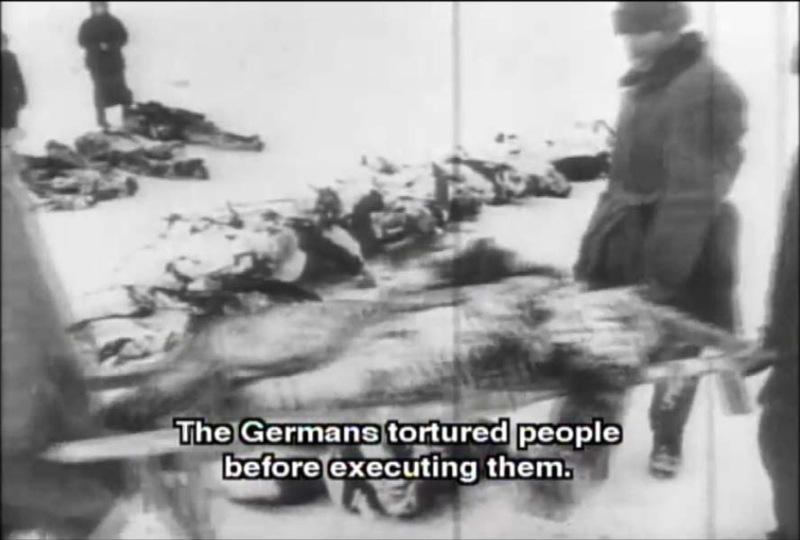 Pictures were printed in the press and the Soviet government formally accused the German command of a war crime. 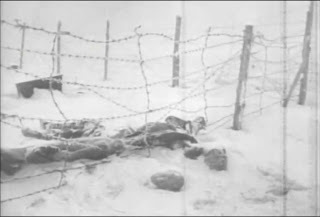 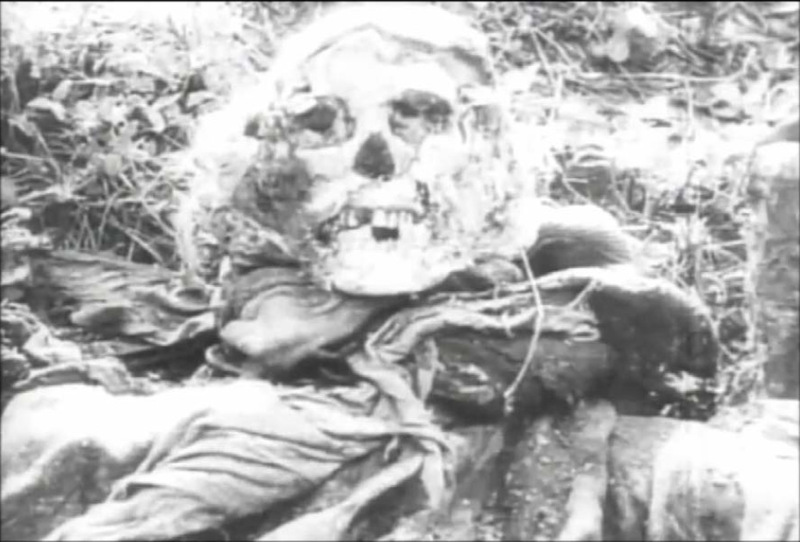 The hunger pains of German soldiers in the Kessel were indeed bad, but others suffered far more. 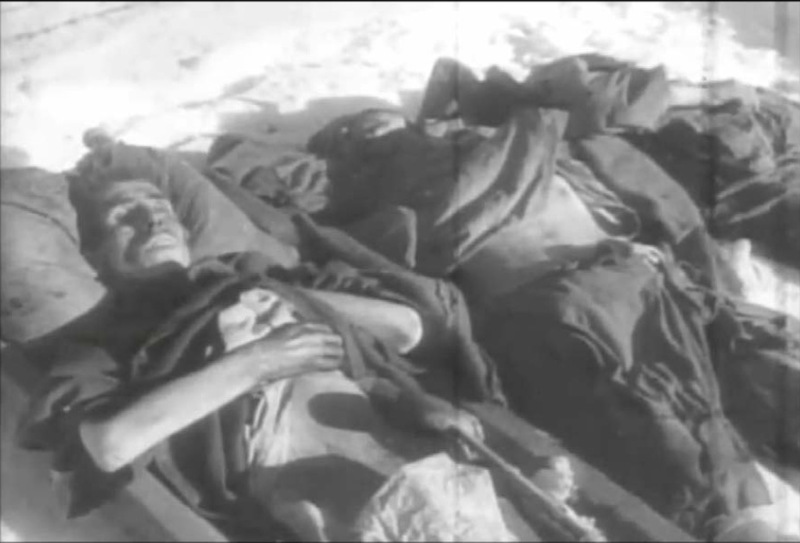 The 3,500 Russian prisoners of war in the camps at Voroponovo and Gumrak were dying at a rapidly accelerating rate. 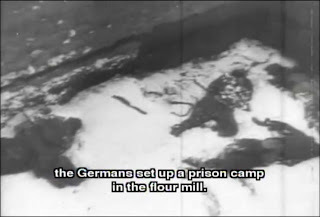 Several German officers were deeply shocked to discover during January that these prisoners were reduced to cannibalism, and made verbal reports. 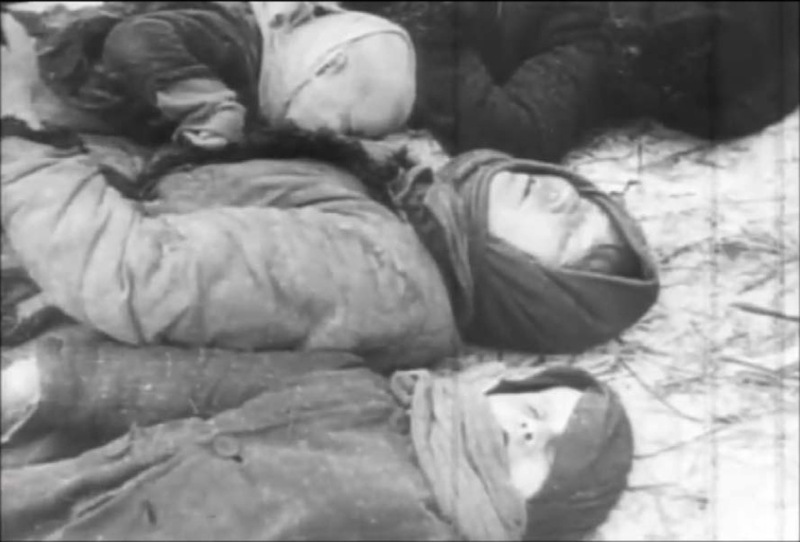 When Russian troops reached the camps at the end of January , the Soviet authorities claimed that only twenty men remained alive out of the original 3,500. 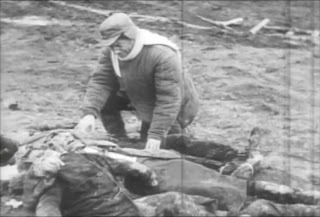 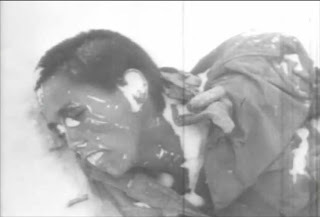 The spectacle which greeted the Russian soldiers – to judge by the film taken by newsreel cameras rushed to the spot – was at least as bad as those seen when the first Nazi death camps were reached. 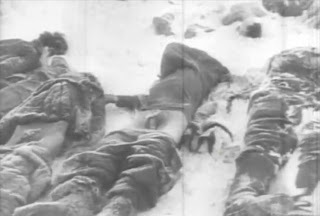 At Gumrak, Erich Weinert described the scene: 'In a gully, we found a large heap of corpses of Russian prisoners, almost without clothes, as thin as skeletons.' 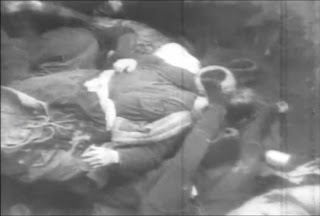 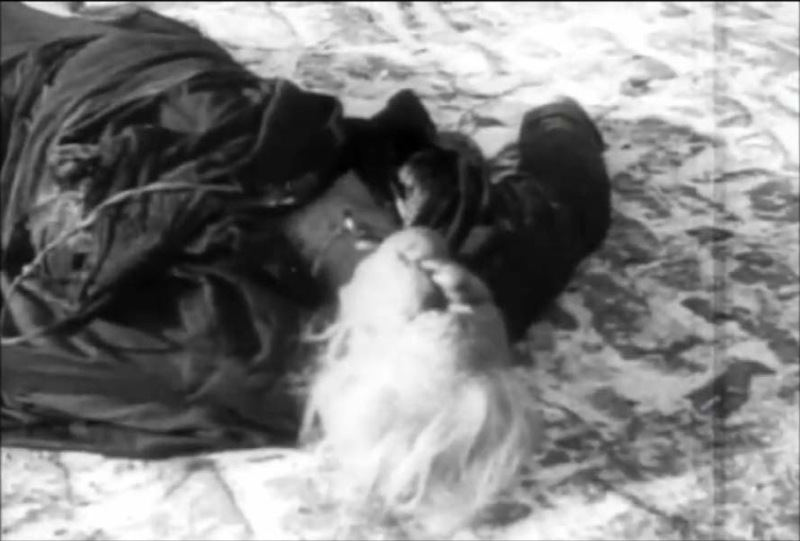 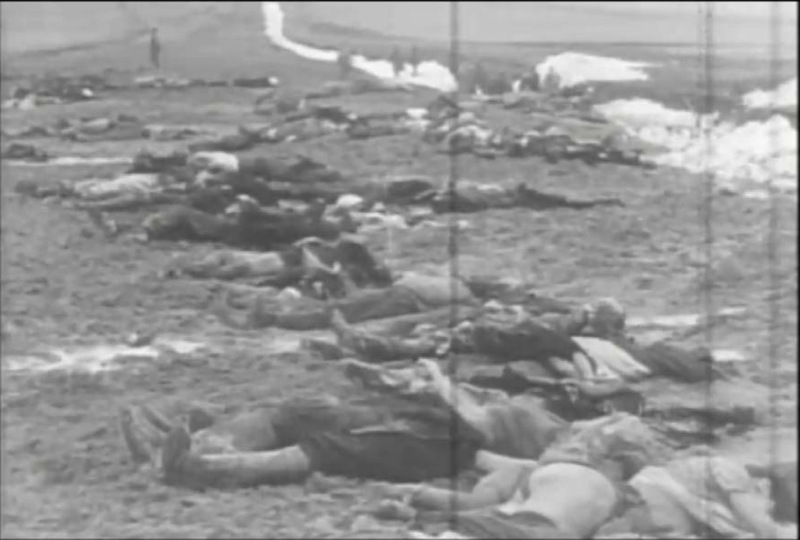 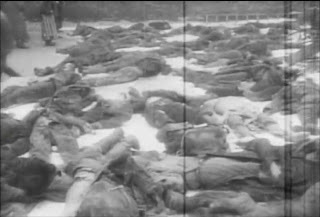 The scenes, particularly those of the 'Kriegsgefangen[en]-Revier' filmed at Voroponovo, may have done much to harden the hearts of the Red Army towards the new defeated. Pyatigorsk is a city in Stavropol Krai on the Podkumok River, in the North Caucasian Federal District of Russia. 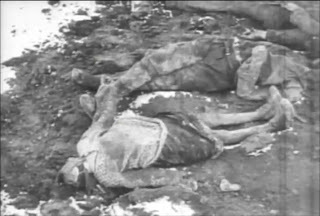 The city’s Jewish population was wiped out by Einsatzkommando 12 of Einsatzgruppe D. What follows is my translation from Angrick, Einsatzgruppe D, pp. 613-615. 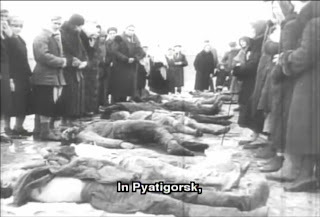 No chance to survive was granted by the occupiers to the Jewish population, whose »evacuation« EK12 started preparing in the usual manner shortly after being stationed in Pyatigorsk at the end of August 1942. 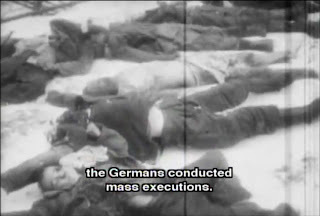 The planning, the preparatory measures and the execution proper Standartenführer Müller again delegated to one of his subordinates, deputy detachment commander Hauptsturmführer Heinrich Wiens, while he himself remained in the background. 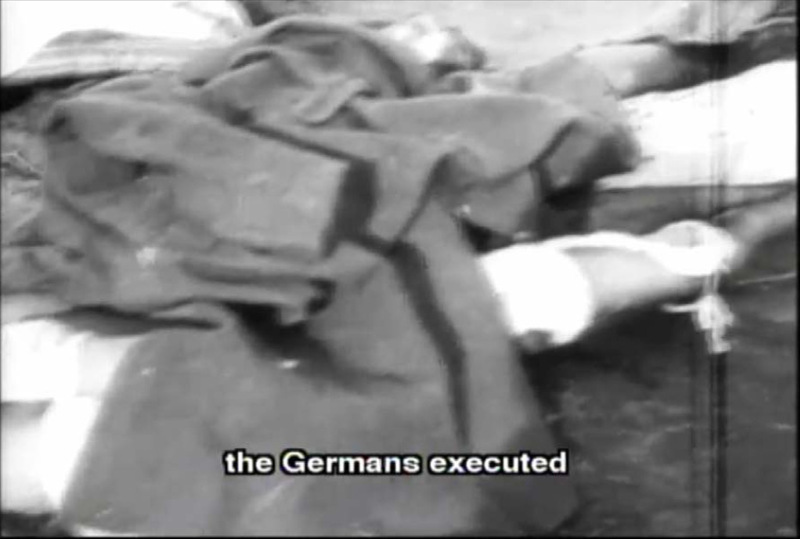 To carry out the murders EK12 for the first time had gas vans at its disposal, which suggests that in the meantime another series of these murder devices had been completed in Berlin and delivered. 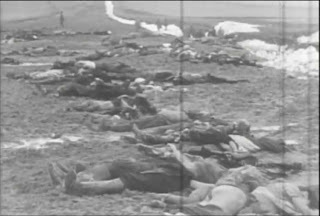 The Jewish population's registration took about eight days, thereafter the detachment ordered their annihilation, According to the call for resettlement, which was directed at the Jewish population of Pyatigorsk and the surrounding villages Goryachevodsk, Svoboda, Novo-Pyatigorsk and Krasnaya Slobodka, all Jews residing at these places had to gather on 5 September 1942 in the cavalry barracks, from where they were to be brought to areas where they would be »a little freer[!] 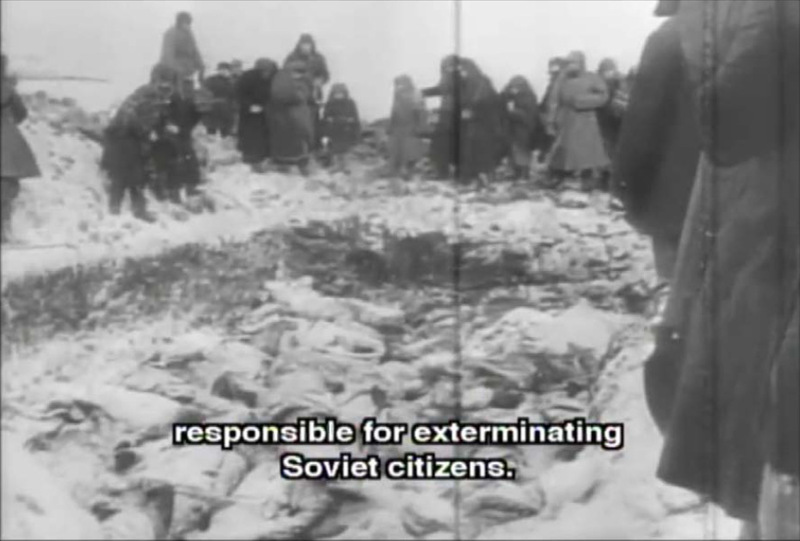 from the remaining population«. 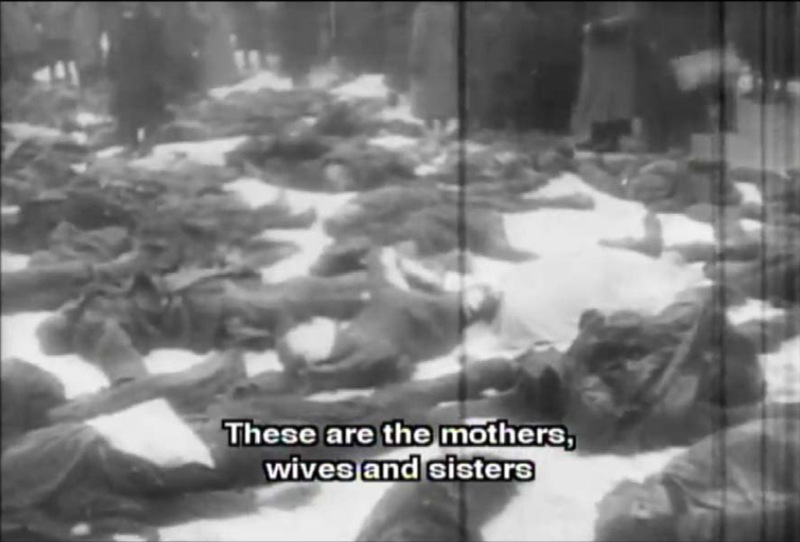 About 800 to 1,000 Jews – men, women and children – heeded the order. 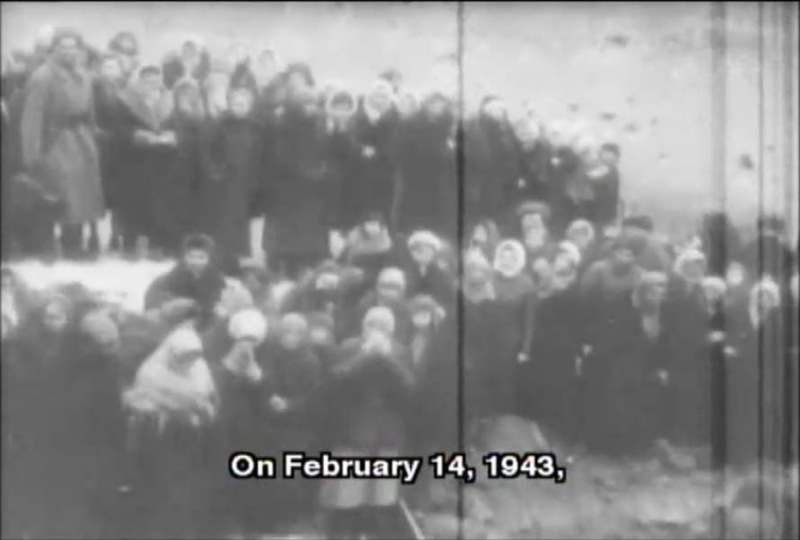 On the yard they were told that they would now be resettled and would thus have to get on the trucks standing ready. After a drive of about half an hour the trucks had reached a gravel pit, the closer surroundings of which had been sealed off by members of EK12 and a unit of local auxiliaries, while the rest of the detachment prepared itself for the execution at the pit. 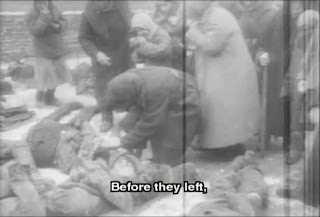 At first the Jews had to get off the trucks and place their valuables onto spread-out blankets, then they had to undress. 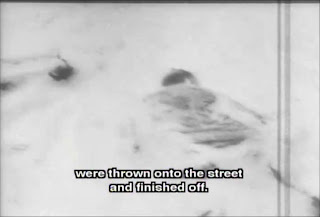 Now completely naked, they were forced to step into the gas van, which for some minutes drove around in the execution site's immediate vicinity and then stopped at the edge of the pit. 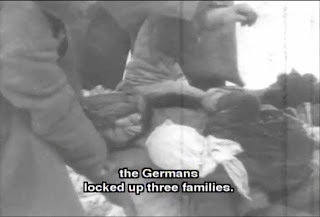 Jewish prisoners, who had been told that they would be spared if willing, now had to drag the dead with their hands from the vans and throw them into the pit, so that the gas van was ready for further operation as soon as possible. Whereas most of the perpetrators fulfilled their tasks calmly and methodically, as Moisse Ewenson put it, i.e. 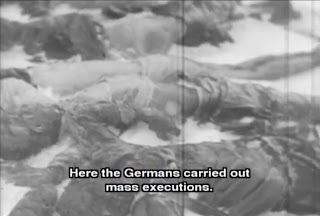 saw to it that none of the captive Jews fled during the execution and that valuables and clothing were collected in an »orderly« fashion, there were also individuals for whom the mere killing was not enough. 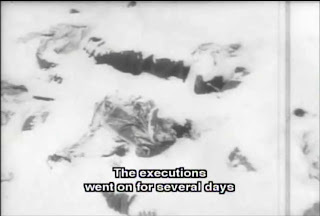 Thus it was reported that Kurt Wenzel couldn't bear leaving the execution to the gas vans or the drivers and assist to it inactively. He therefore ordered a blond Jewess, shortly before she stepped into the gas van, to come forward and lie down somewhat aside with her legs pulled up. 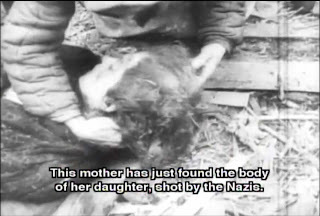 Wenzel told her that he knew well that she still had hidden gold, which the anguished young woman energetically denied. None of the victims survived the day. 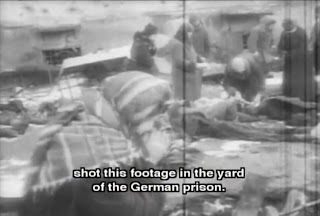 After the van had been »emptied« one last time, the detachment finally murdered the prisoners who had taken the corpses out of the van's interior, and returned to its lodgings certain of having fulfilled its task. 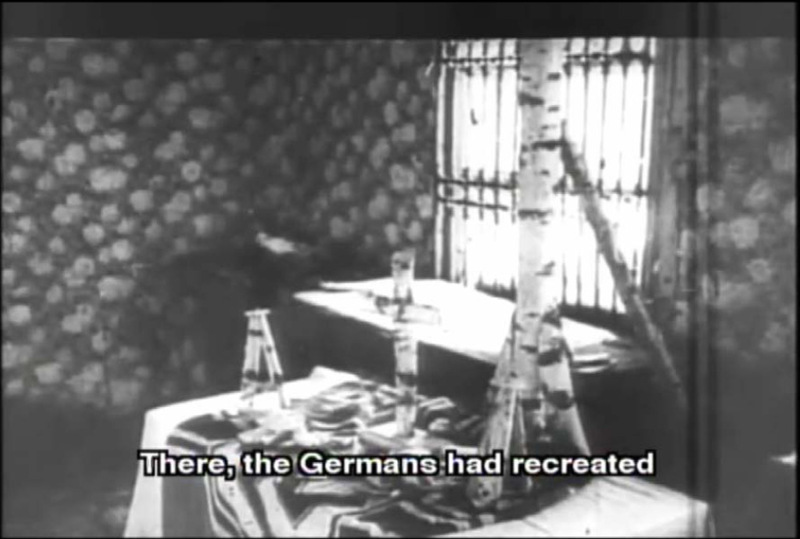 Although Pyatigorsk was thus considered »free of Jews«, Dr. Müller was not completely satisfied. 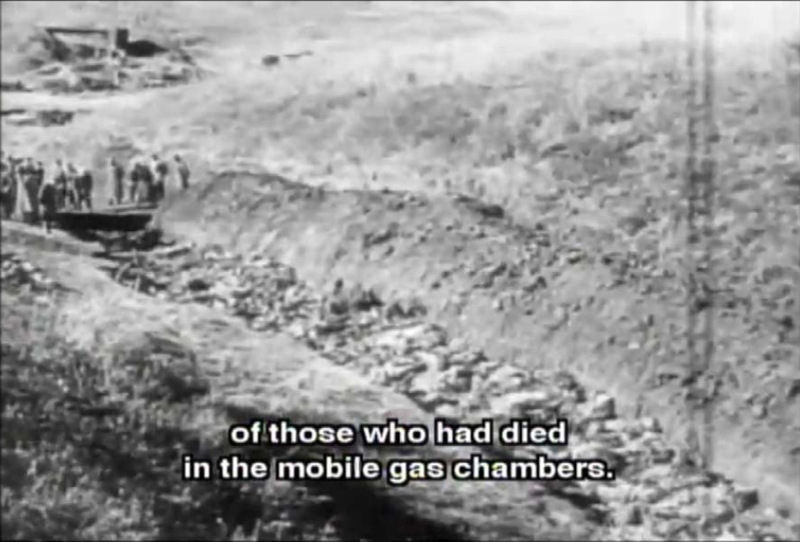 The prescribed use of gas vans was not to his liking at all. He emphasized towards Dr. Heinrich Bolte and other present leaders of Ek 12 on occasion of a joint visit at the officer's mess that he would prefer continuing to shoot the Jews. 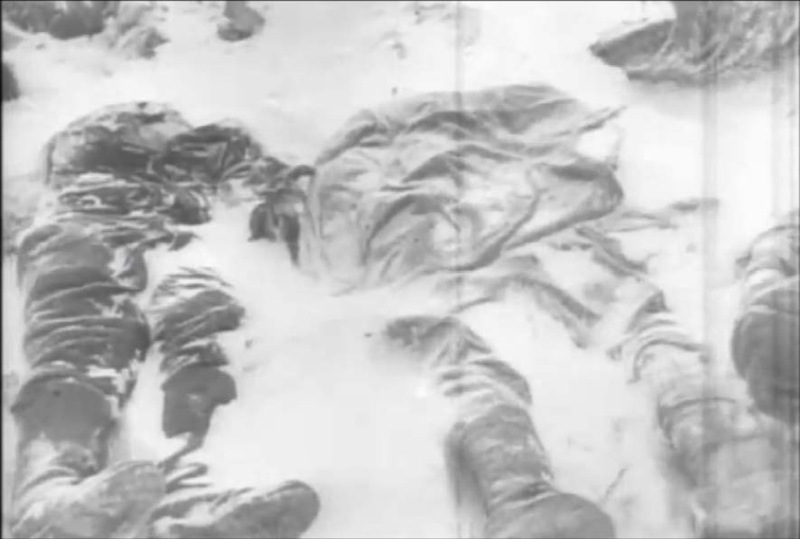 Rossoch is a town in Voronezh Oblast, Russia. 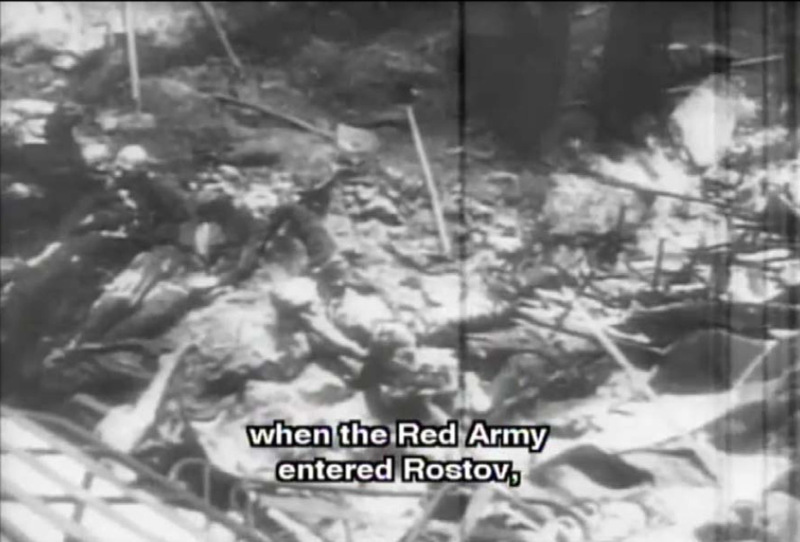 In January 1943 the Ostrogojsk – Rossoch region was the site of a major Red Army offensive. The activities of Einsatzgruppe D during the second Nazi occupation of Rostov are narrated on pp. 561-566 of Angrick’s book. After the city was conquered by German troops in July 1942, the occupiers found a population that had lived through a harsh period of forced labor and Soviet NKVD terror (800 persons had been executed on grounds of having collaborated with the Germans during the city's first occupation) and was therefore rather docile towards the Germans. 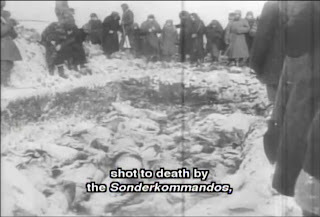 Nevertheless the Sonderkommando (Sk) 10a of Einsatzgruppe D and a unit of the Wehrmacht’s Secret Field Police (Geheime Feldpolizei - GFP) started to make numerous »permanent arrests«; until 2 August 1942 they had already apprehended 700 persons and executed 400 of them, mainly partisan stragglers and communist party members. 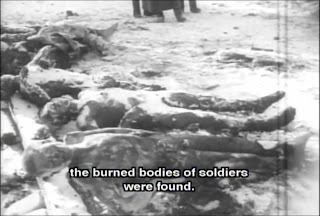 They also scanned the Rostov POW camp for Jews, communists and commissars, of which they selected and executed about 70 in the first two days of occupation, by shooting or gassing in a gas van. 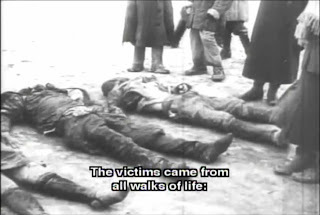 Thereafter Sk 10a went about to register the Jews who had remained in Rostov. Most of the city’s about 50,000 Jews had been evacuated by the Soviets following the brief first German occupation, but about 2,000 had remained behind – mainly elderly and sick persons as well as women and children who could not or had not wanted to be evacuated. The Jews were called upon to gather at a specified place on 11 August 1942, ostensibly in order to be moved to a part of the city where they would not be exposed to acts of violence from the non-Jewish population. 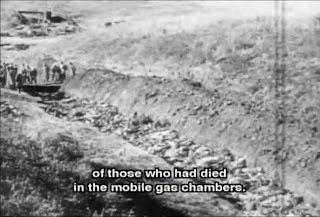 Actually they were taken to a place called the ravine of the snakes, where they had to deliver their valuables and undress before being shot and dumped into pre-dug sand pits. 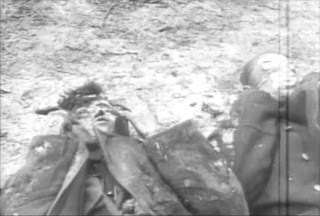 The killing had not ended by the evening of 11 August, and on the next day a gas van was brought to help finish the job. 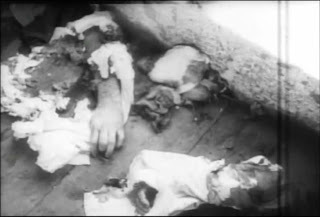 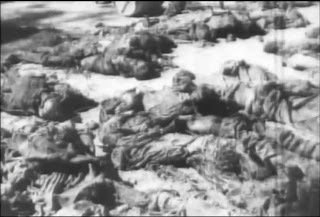 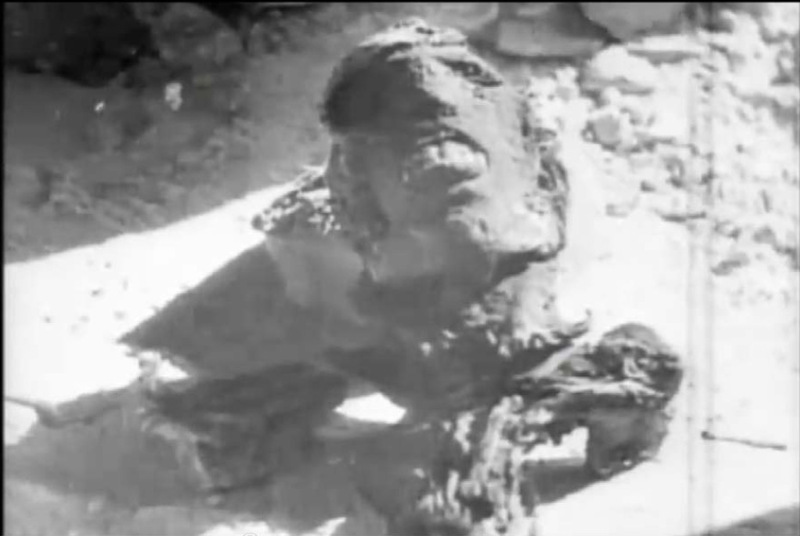 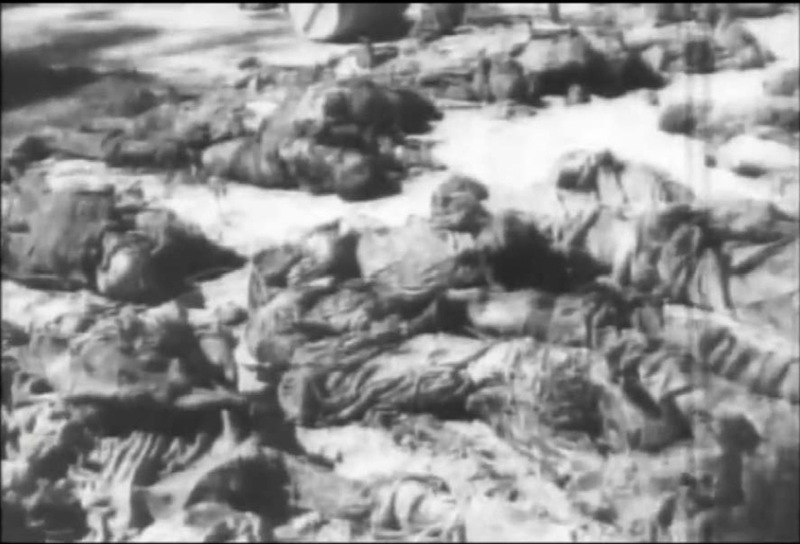 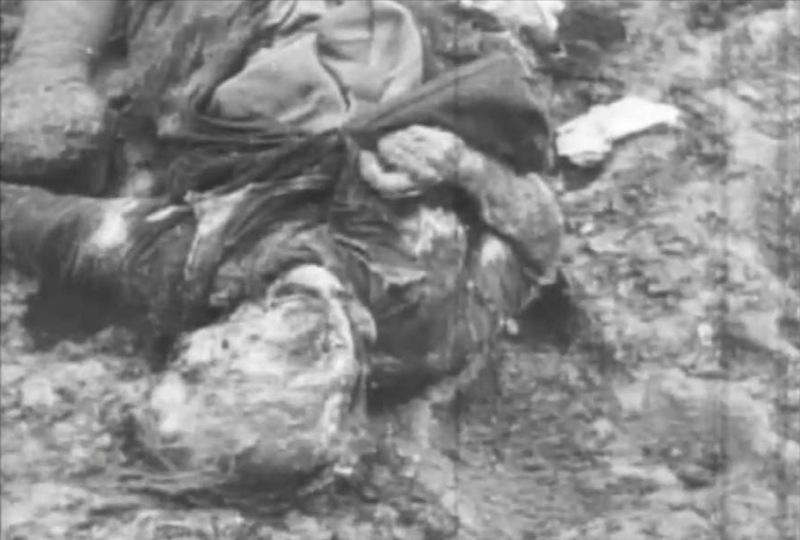 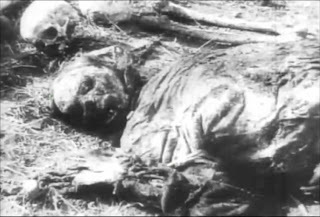 After the victims had undressed in the cellar of a public building and entered the gas van, the same drove to the ravine of the snakes, where the detachment’s auxiliaries (many of them Soviet prisoners of war captured at Sevastopol and recruited by Einsatzgruppe D) pulled the cruelly disfigures corpses out of the van and threw then into the pits. 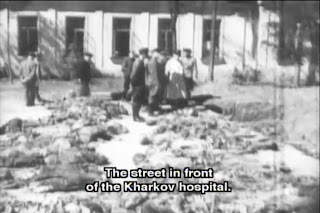 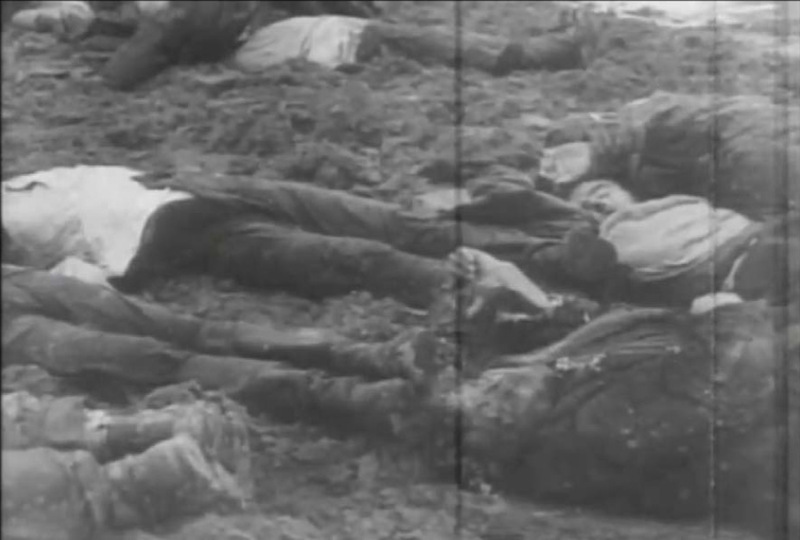 On the second day alone at least 300 Rostov citizens were thus killed. 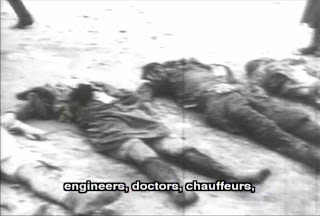 The operation continued for another day, after which the execution detachments carried out "after-cleansings" (Nachsäuberungen), as one auxiliary put it, i.e. 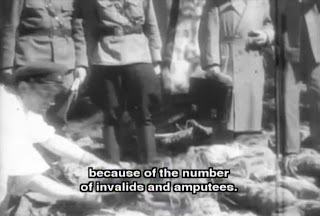 they rechecked the POW camps for Jews and commissars and also killed sick POWs and vagabond teenagers. 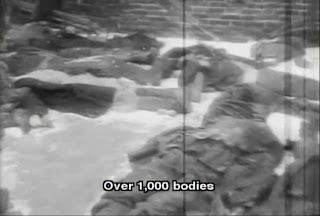 The total number of persons killed by Sk 10a in Rostov is unknown but probably exceeded the estimated 2,000 Jewish inhabitants. 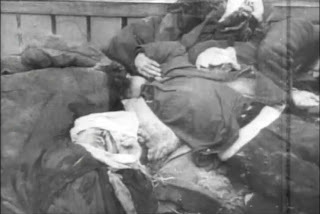 Thereafter Sk 10a moved on southward in the wake of the German summer offensive, and Rostov was taken over by Einsatzkommando 6 of Einsatzgruppe C, which continued searching for hidden Jews and other perceived enemies in the city and its surroundings together with the 2nd Battalion of Police Regiment 6. The policemen usually handed those they apprehended to EK 6 or the GFP for execution, except when they needed them to clear minefields by walking across them; prisoners who refused this suicidal task were shot. 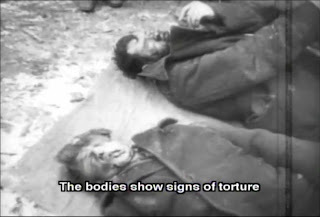 Especially threatened during the phase of retreat were the inmates of internment camps and prisons. 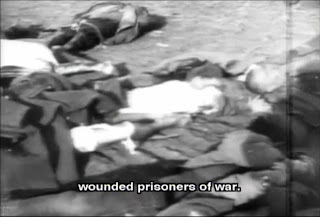 As was already mentioned, the majority of prisoners of war were evacuated, invalids mostly left behind, but in many cases they were murdered before withdrawal. 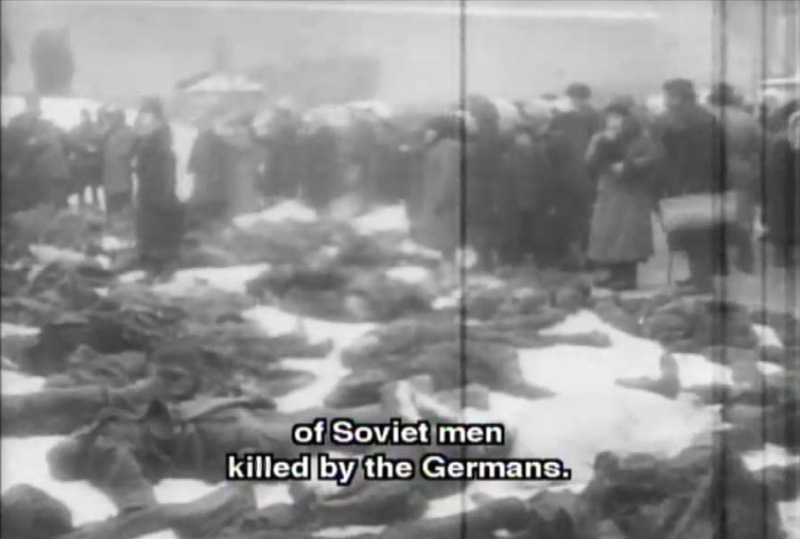 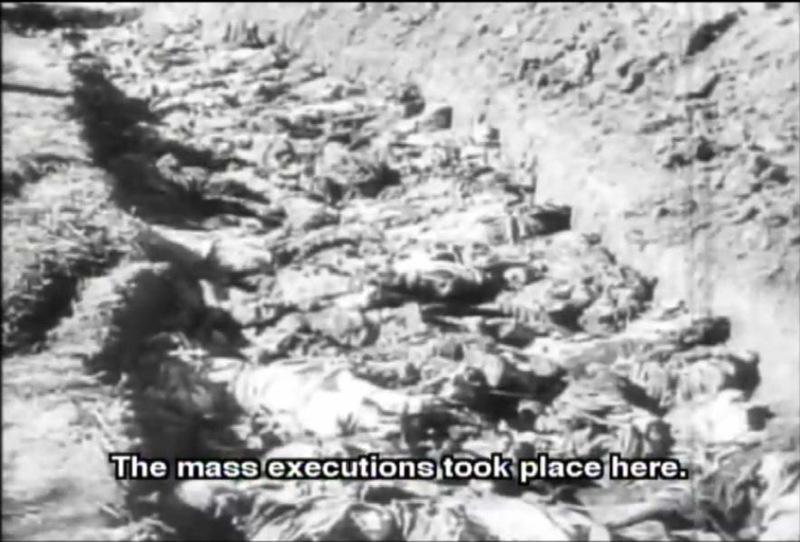 Especially the security police murdered inmates in order to prevent their liberation by the Red Army. In Bobruisk and Borisov the Security Police since May 1944 shot the inmates of prisons and camps. 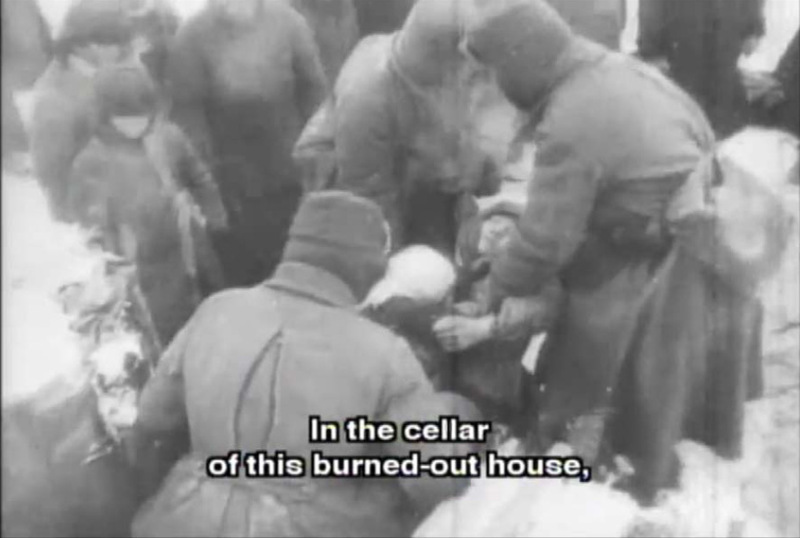 The prison in Roslav was set on fire on 21 September 1943, so that the inmates met a cruel death inside. 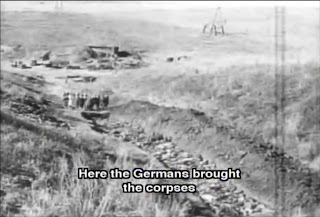 Yet not only the Security Police, but also their colleagues of the Secret Field Police (Geheime Feldpolizei - GFP) committed such mass crimes. 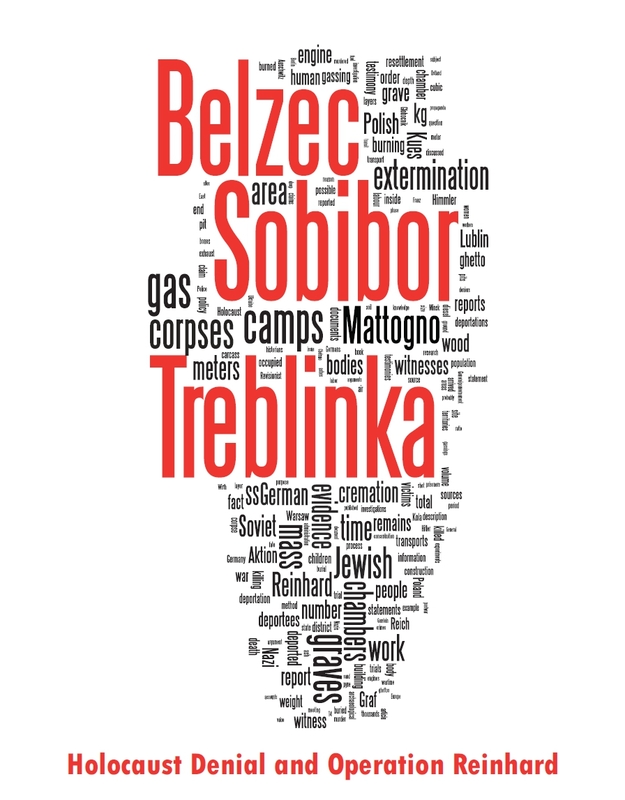 Thus at the end of July 1943 the GFP Group 580 murdered 350 inmates at Brjansk and 450 at Orel before withdrawing from these locations. Rather unclear is the fate of civilian inmates of Wehrmacht camps. Army Group North, which itself had 15 penal camps, handed over their civilian internees to the Security Police. 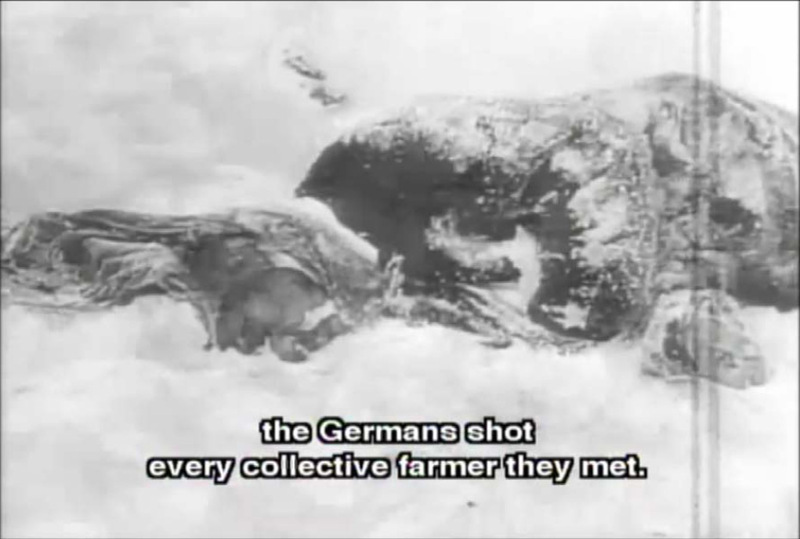 About their further fate nothing is known. 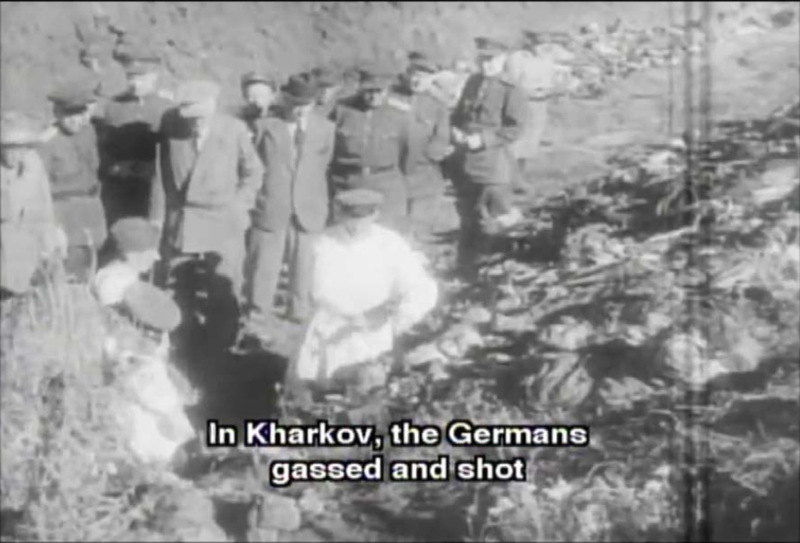 The German occupation of Kharkov and the occupier's crimes against Soviet prisoners of war and the civilian population, including the massacre of the city's Jews at Drobitski Yar, are addressed in the HC forum's thread Kharkov under Nazi Occupation and in the blogs Neither the Soviets nor the Poles have found any mass graves with even only a few thousand bodies … and Drobitski Yar. 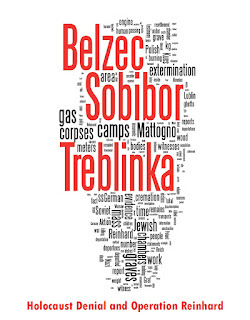 Roberto, this is simply outstanding work! 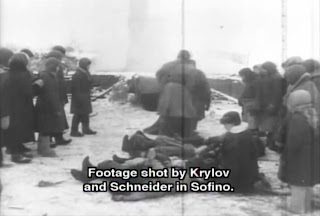 I would like to have more information about the events/places shown in the documentary, especially the Rostov massacres in November 1941 and January/February 1943, Barvenkovo, Sofino, Prokhladnoe and Rossoch. If you happen to come across anything, please let me know. The Sonderbehandlung of 6,402 Jews at Kremenets, in Volhynia (Ukraine), was reported by Rasp of the SD in a report in August 1942. 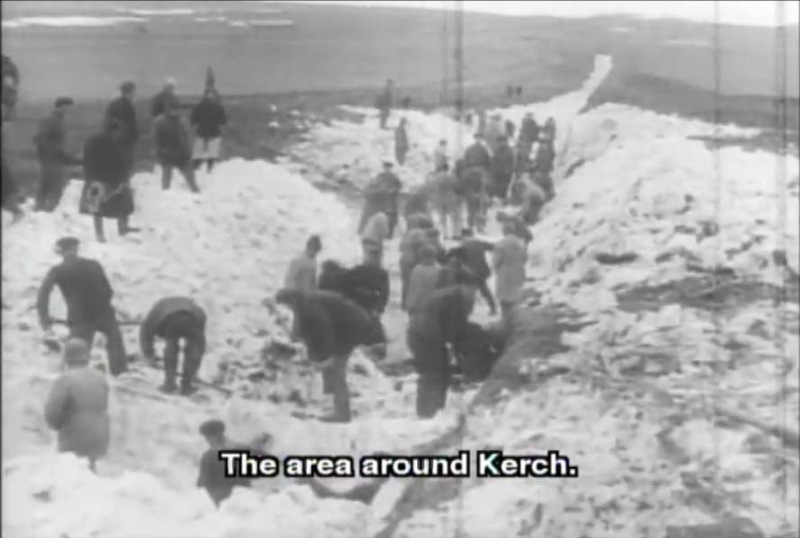 Kremenets appears at 28:00 in the documentary. 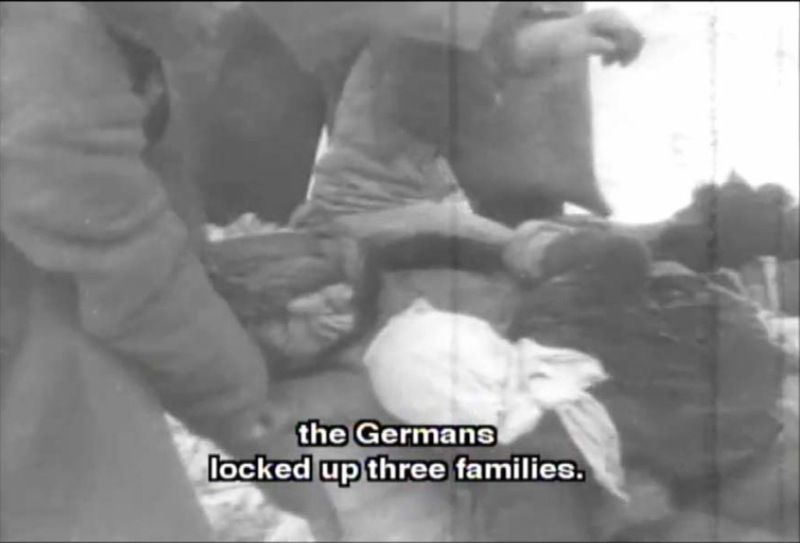 Gerlach, p.715, n. 1154 has a total of 13,802 Jewish deaths in Gebiet Kremianez, from a report of 15.8.42. I think I saved the videos. 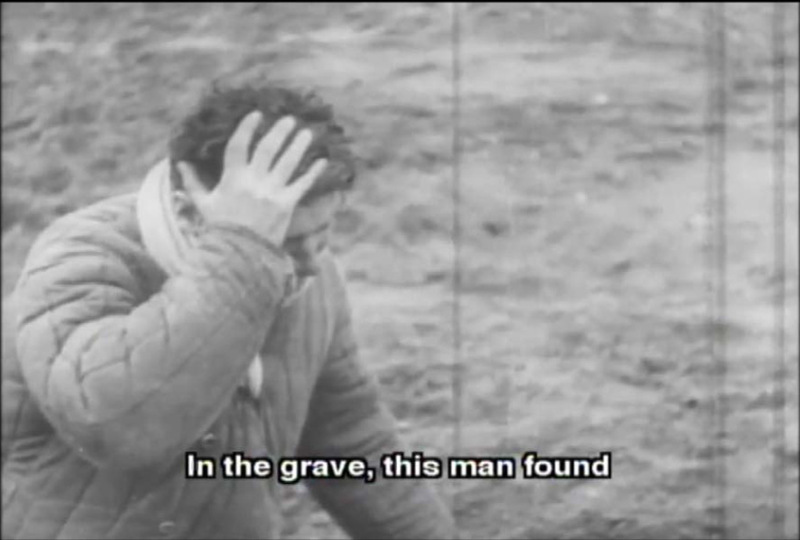 I'll look and then leave a message. 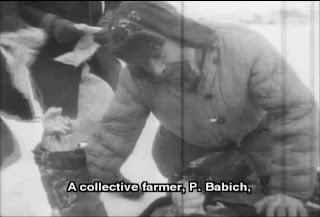 I am just discovering all of this. 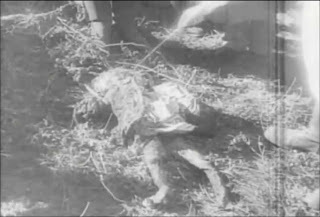 The film footage tells the tale. 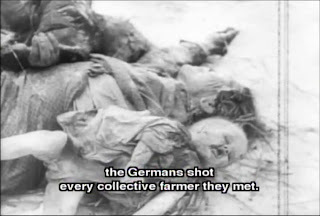 The viciousness against innocents must never, ever be forgotten but made available for future generations to know it can all happen all over again if the good people of earth do nothing against tyranny, including that of United States here and abroad. 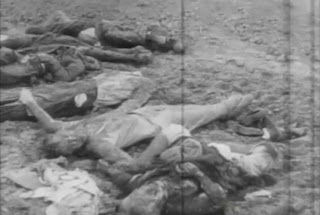 Dr. Ljudmila Nazarewskaja, a physician from Rostov, subsequently said about the gassings there: "On the evening of 10 August , after the murder of the Jews, three hundred soldiers from the Red Army were also killed at the same place [the Snakes' Gulch]. 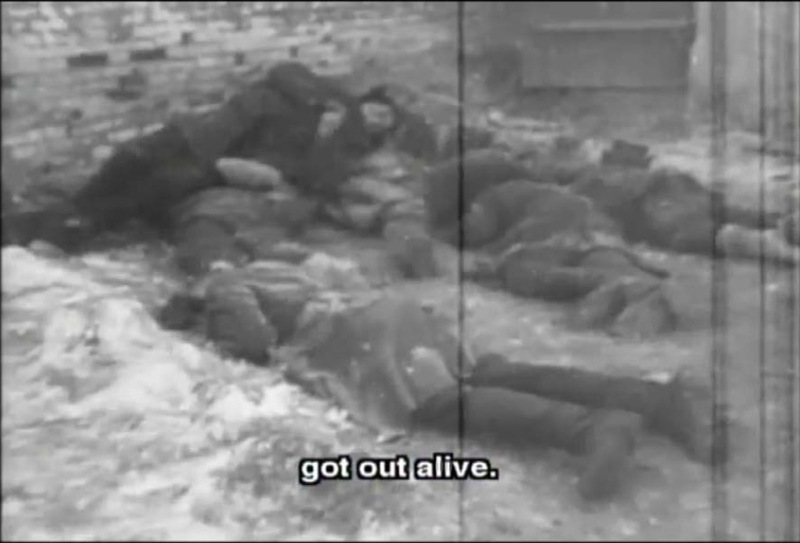 The soldiers were driven to the railroad crossing. 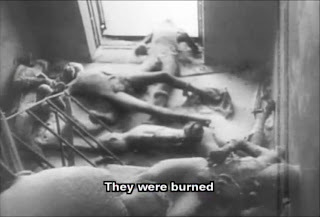 They were loaded into a special gas van. 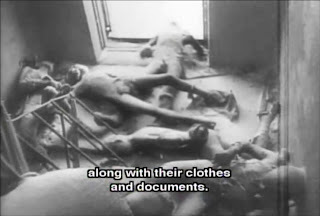 As soon as they were dead they were unloaded....Some of the Jews were also murdered in the same van." (45)"
Such cruelty will never be forgotten by the almighty! 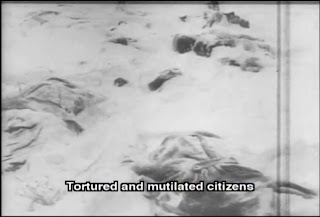 Such cruelty is being forgotten nowadays. 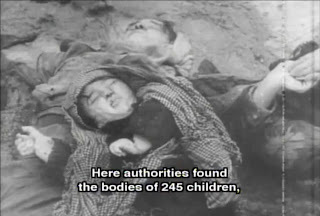 It is too important to teach every child about these mass massacres. What IS is doing now, is in the same category.